Every city, town, region has their “season”. 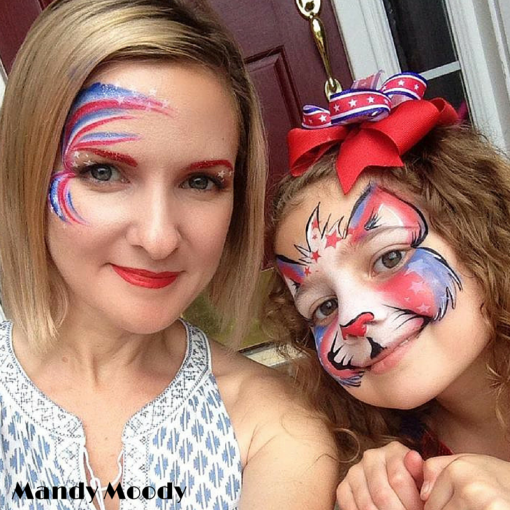 For those of us close to the Equator, once the sun starts beaming and the humidity rises our season gets sketchy. 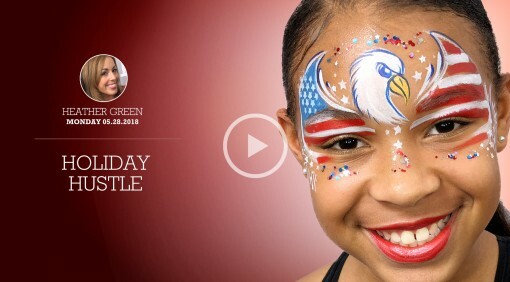 But no matter where you are Patriotic Holidays are always a big day for us. 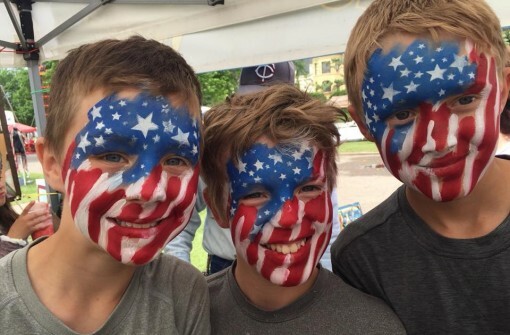 Here in the US, 4th of July is a BILLION dollar holiday. 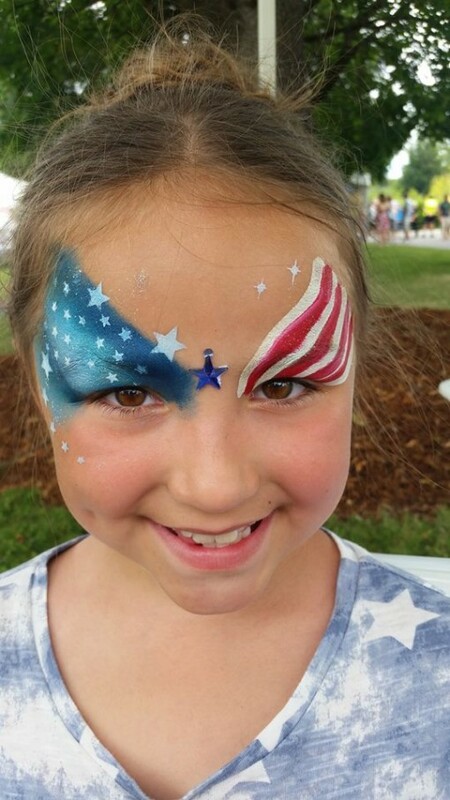 Between events, fireworks, BBQ and traveling its a great time to maximize bookings. 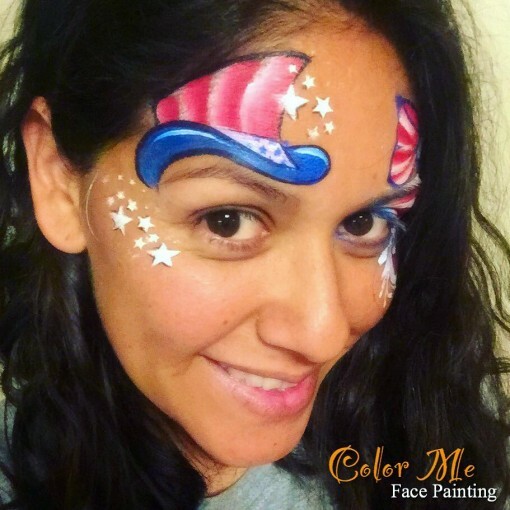 I put together this blog to inspire you to paint, play, and make those profits! 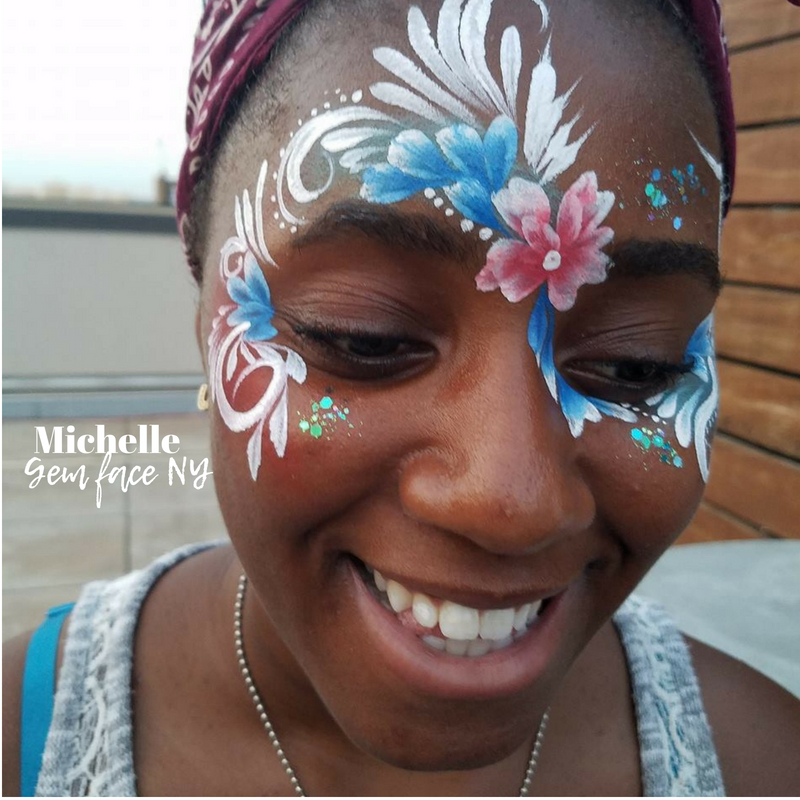 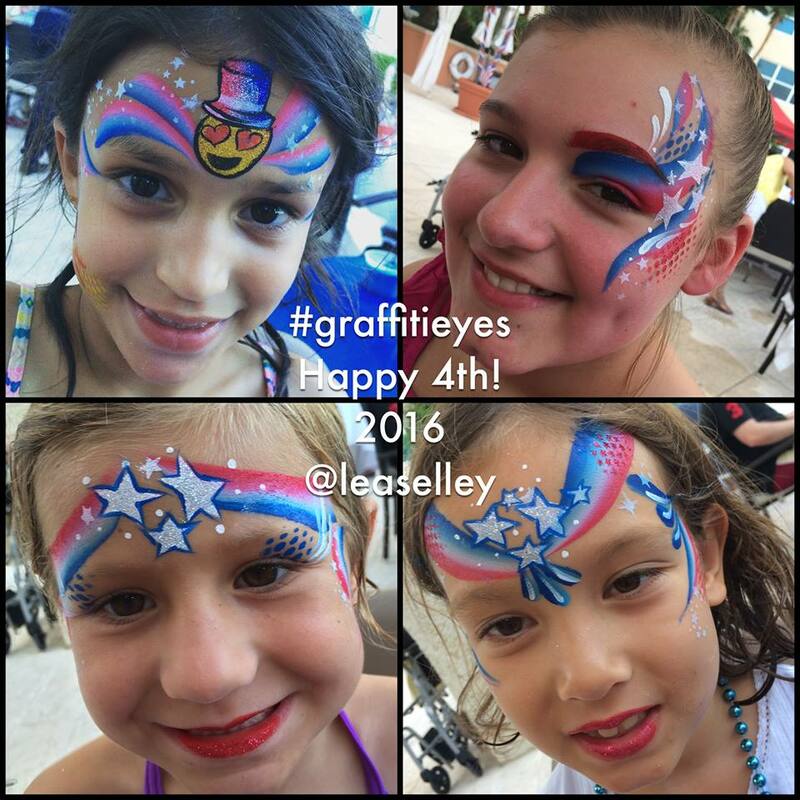 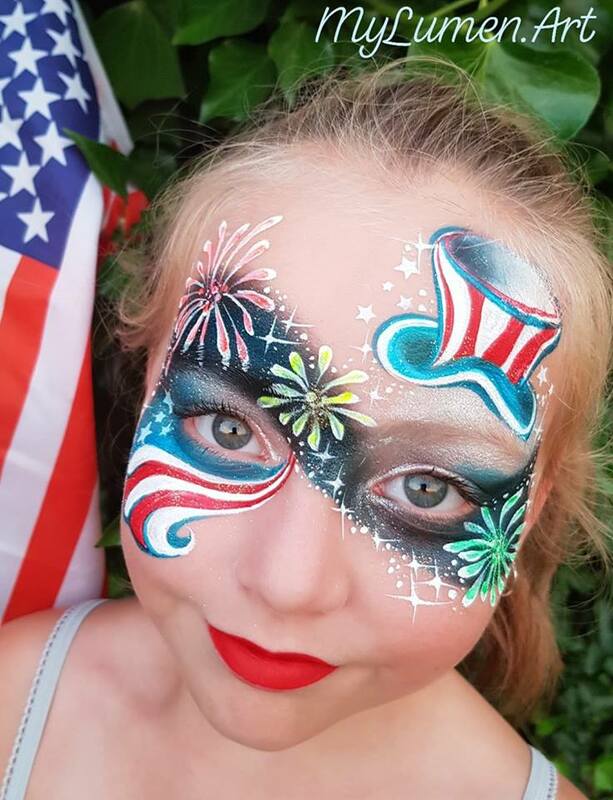 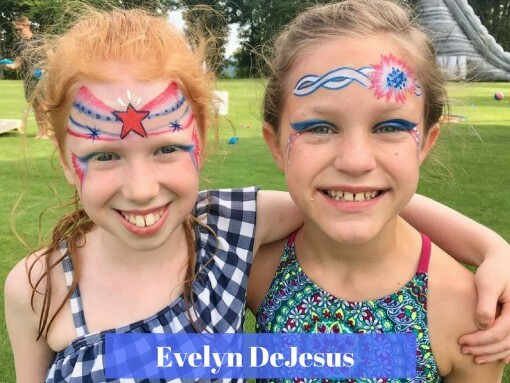 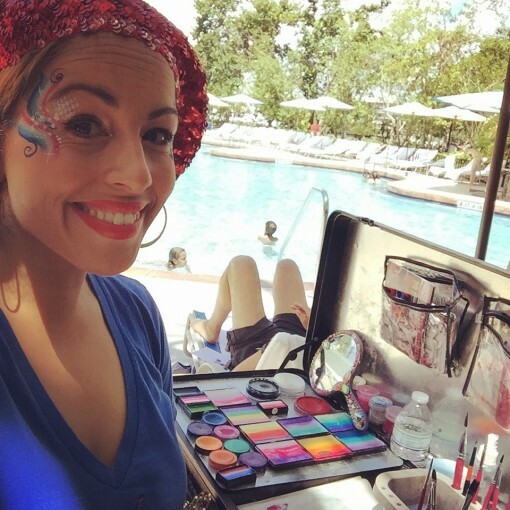 Over Memorial Day weekend I was hired poolside to do face painting. 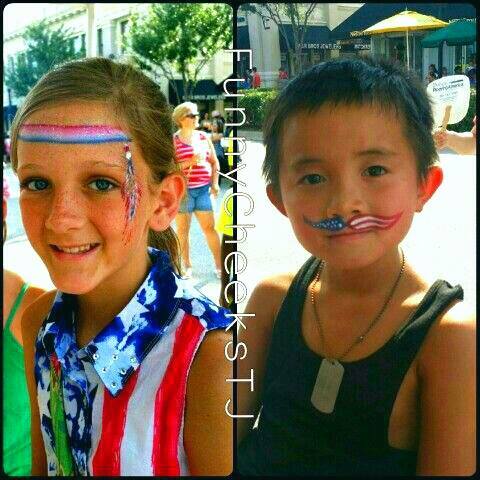 It was so hot, humid and sticky. 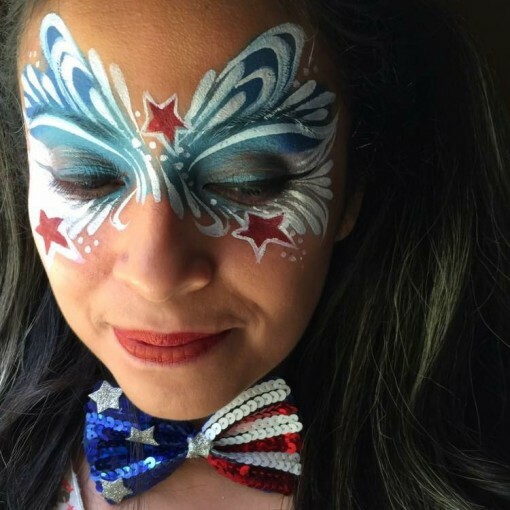 Everything was melting including my eye brows luckily for me I had Glitter tattoos in my trunk so I whipped them out and saved the day. 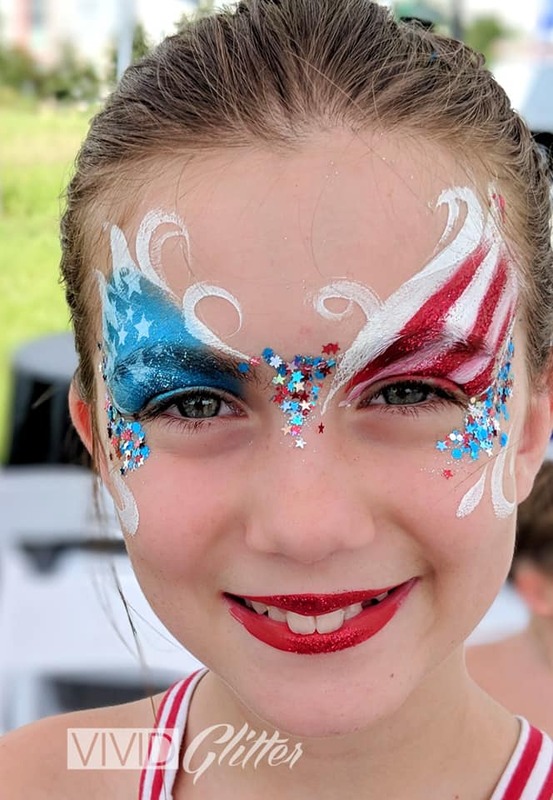 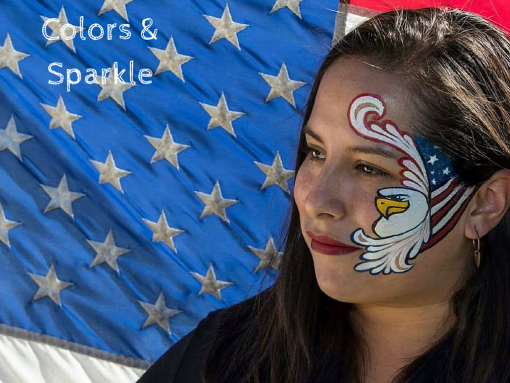 While Glitter tattoos are NOT new they are something you can offer with a Patriotic flair. 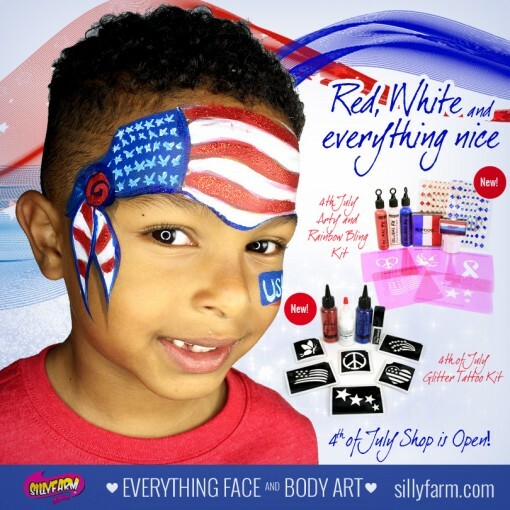 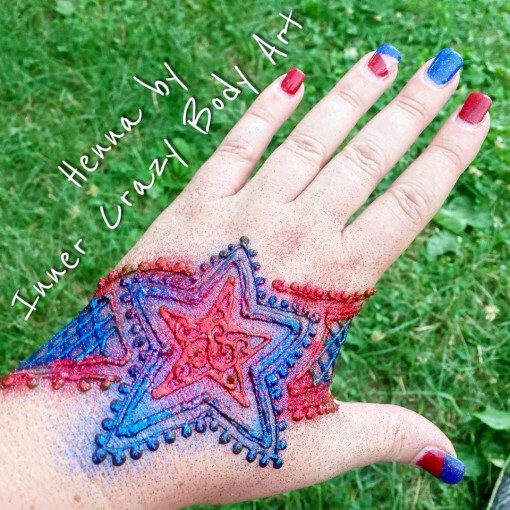 We put together a 4th of July Glitter tattoo kit that includes red, white and blue everything. 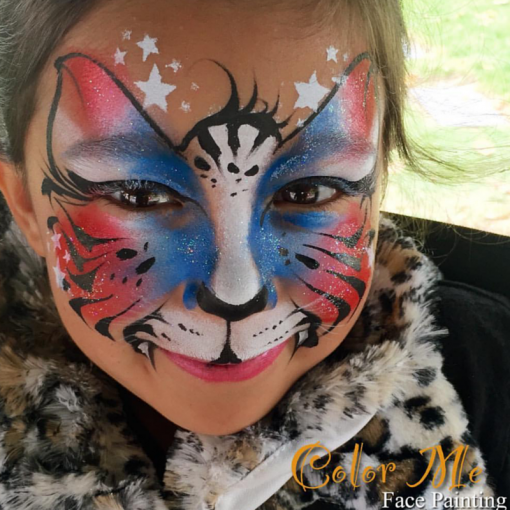 Sometimes our customers need help knowing what they want because they dont even know it yet. 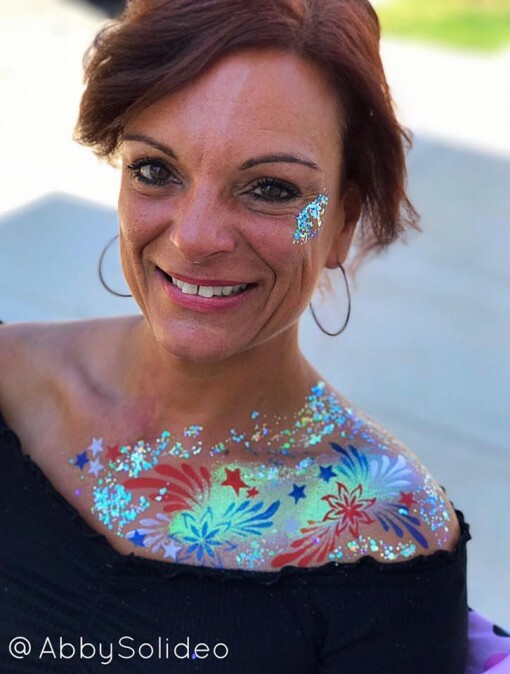 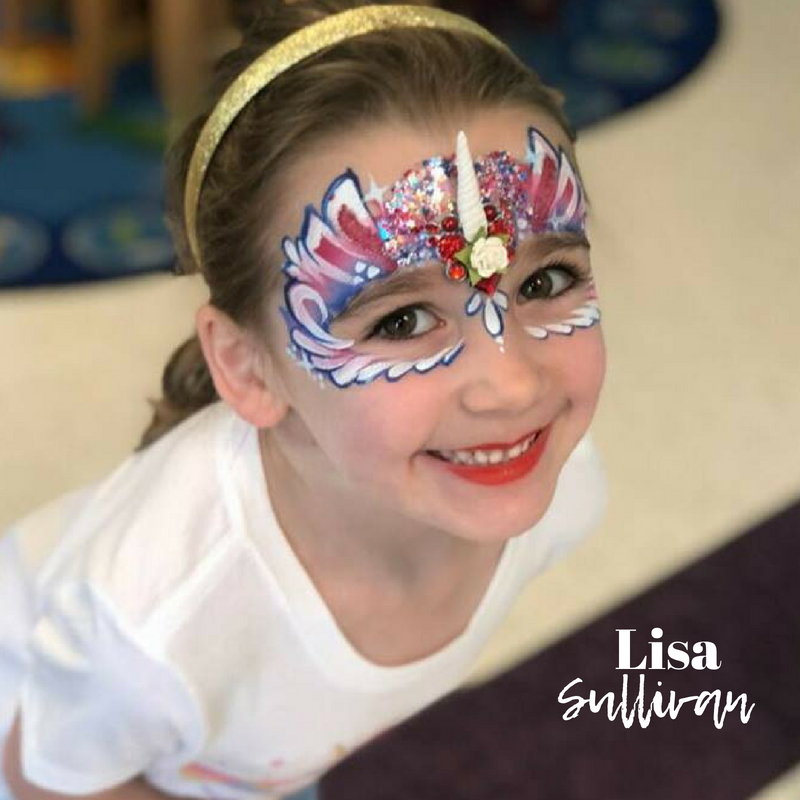 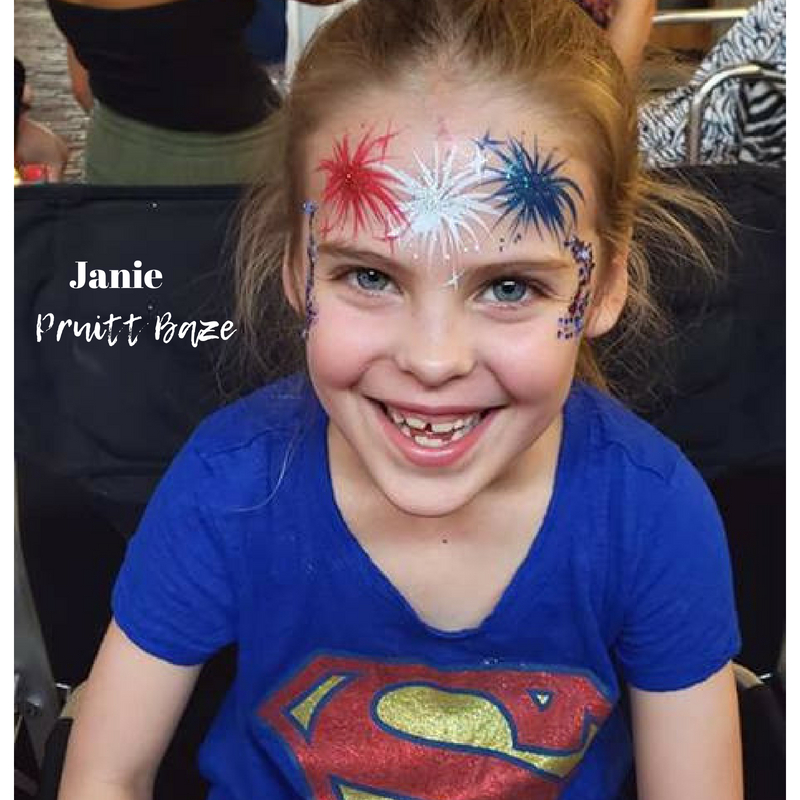 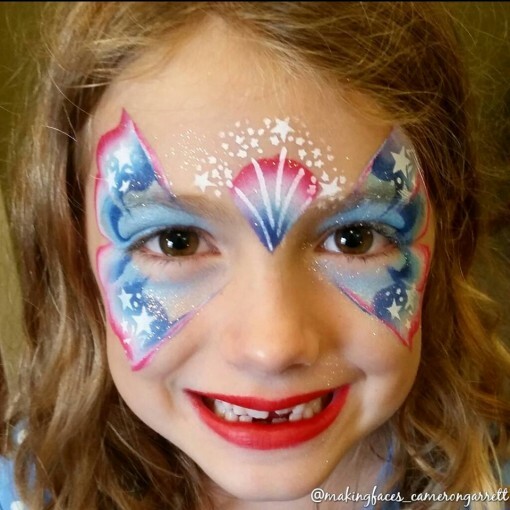 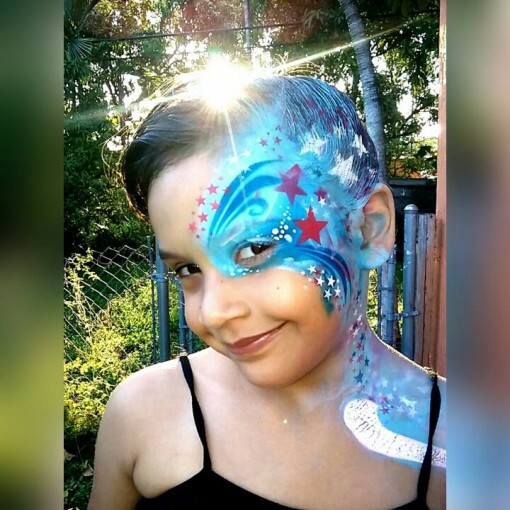 Many of them have never heard of a Glitter tattoo, many of them have no time to think about “what else” they can ask for besides face painting. So be proactive and plant the seed. 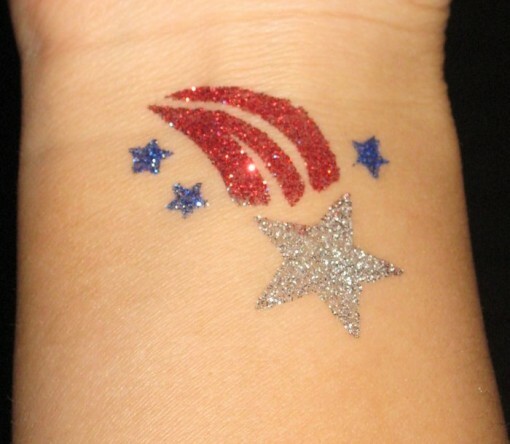 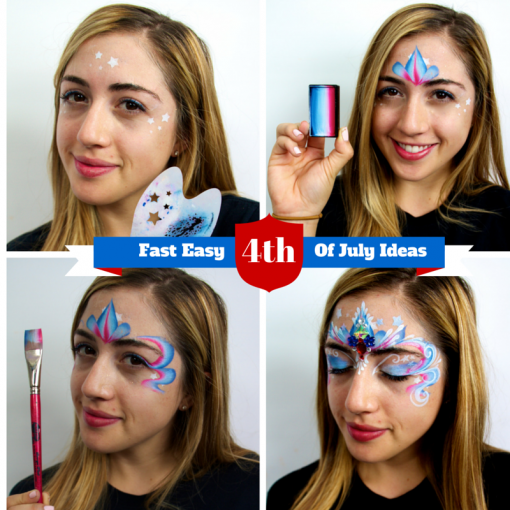 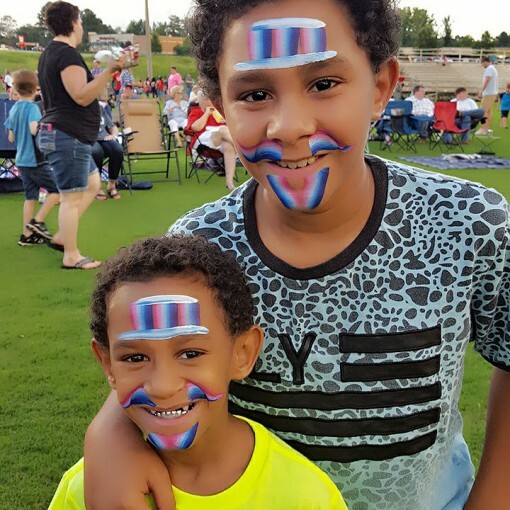 Another popular idea for 4th of July pride is Airbrush Tattoos. 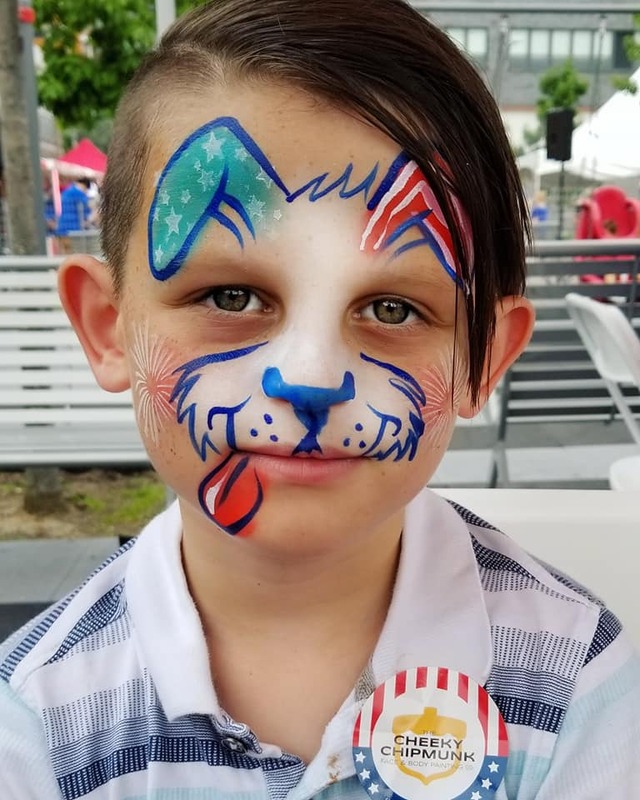 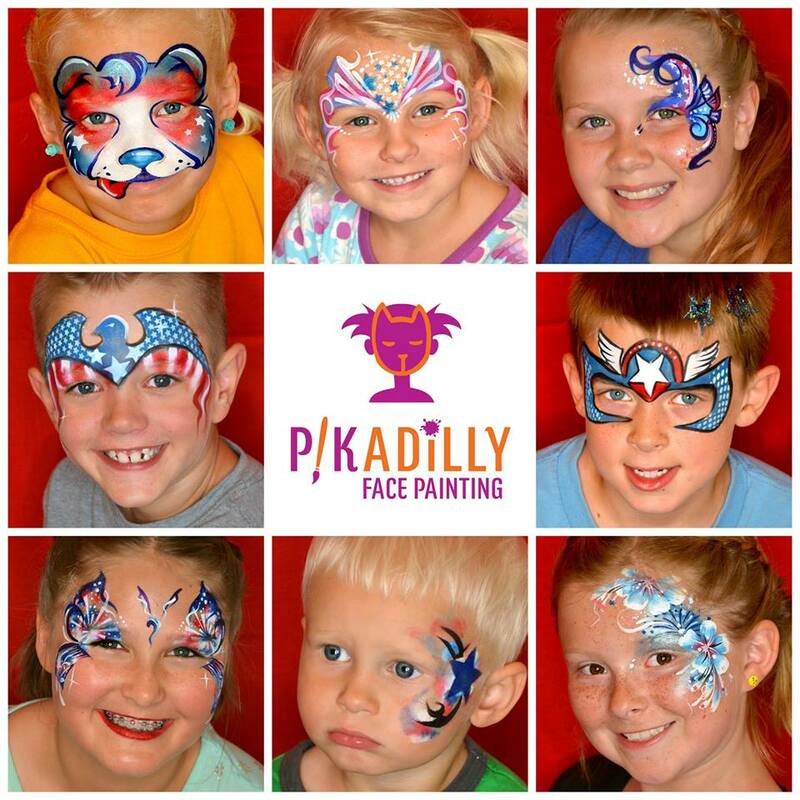 If you are working large public events, face painting takes time. 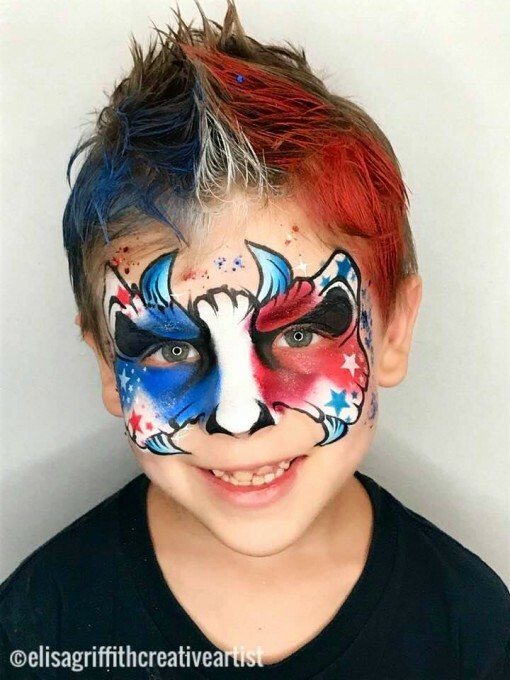 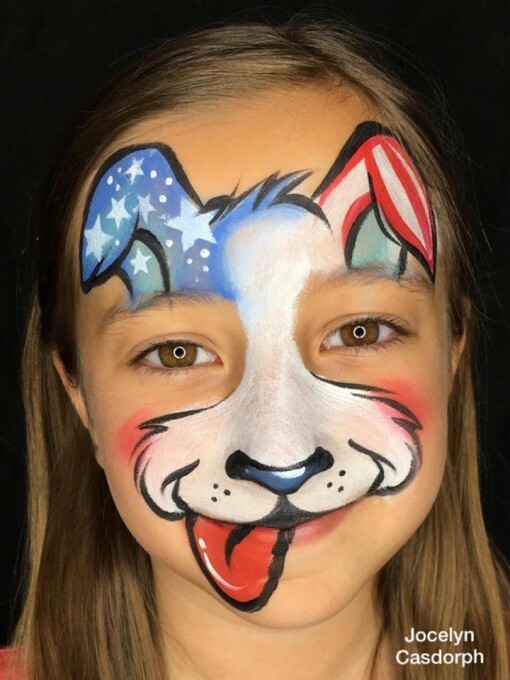 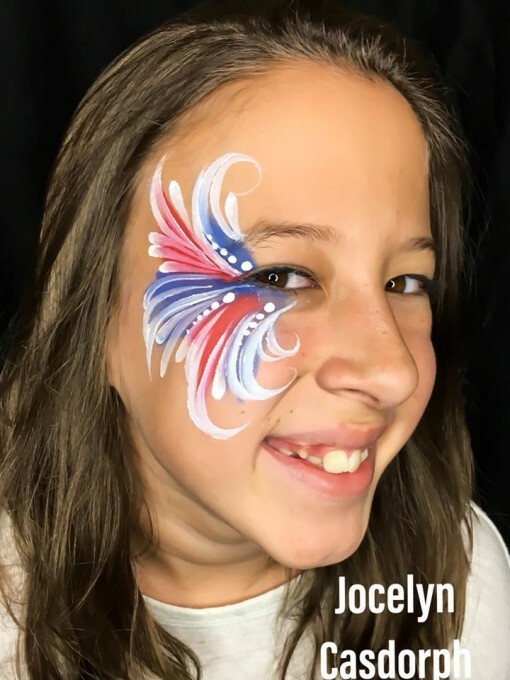 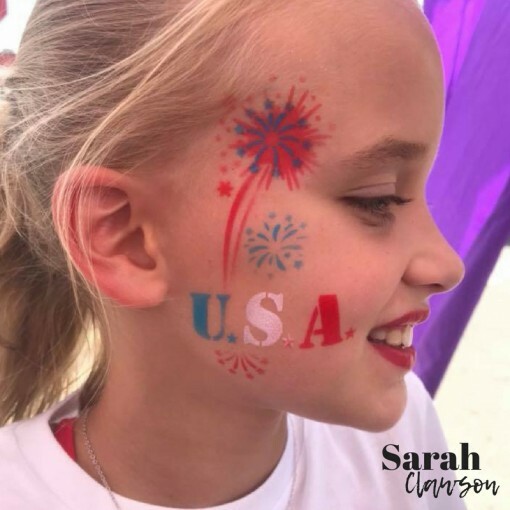 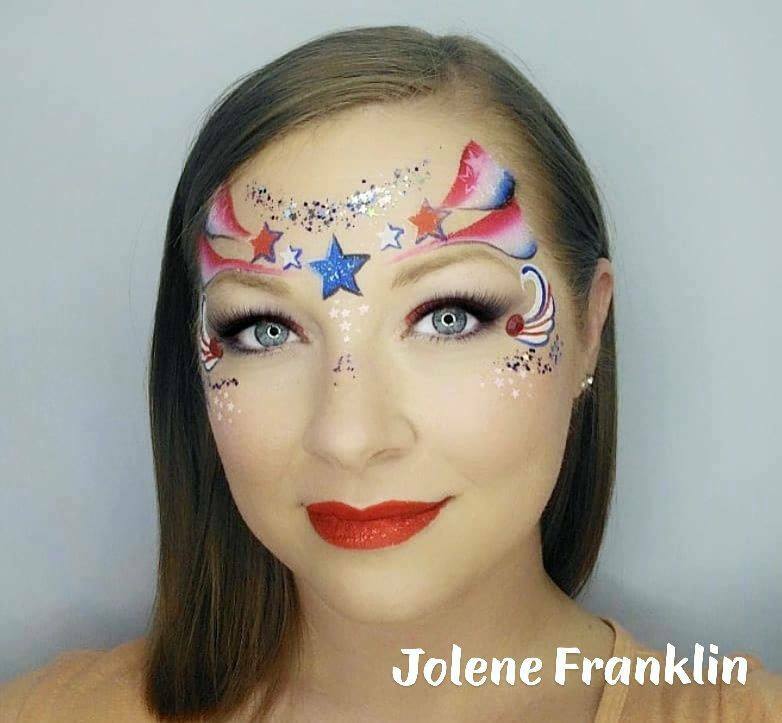 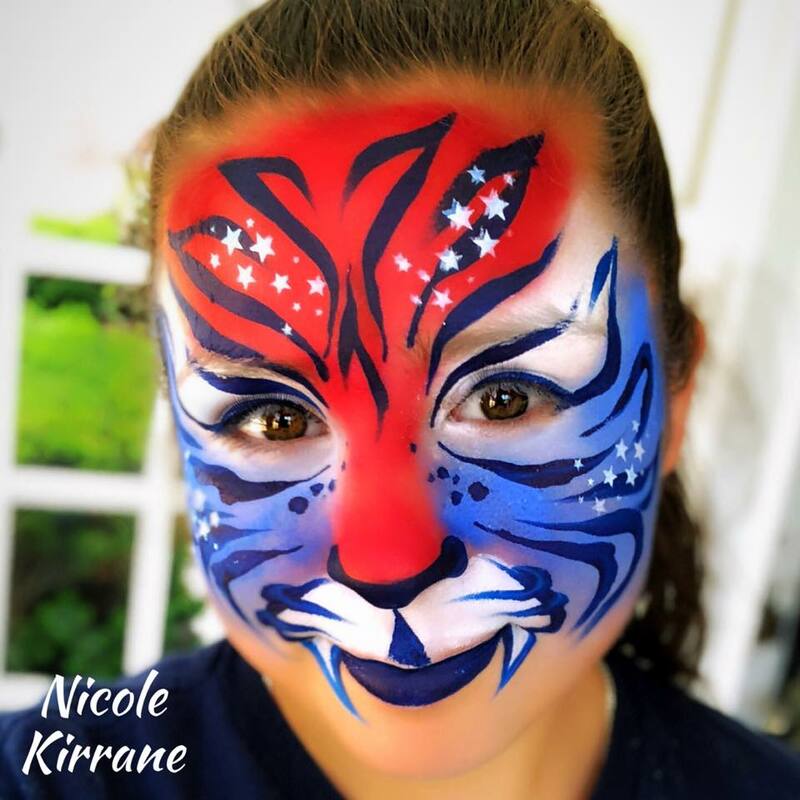 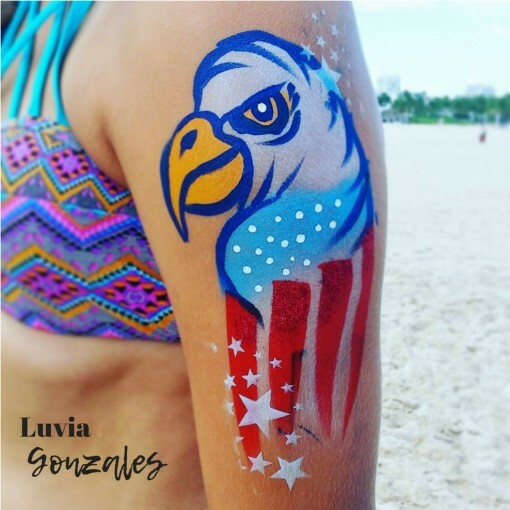 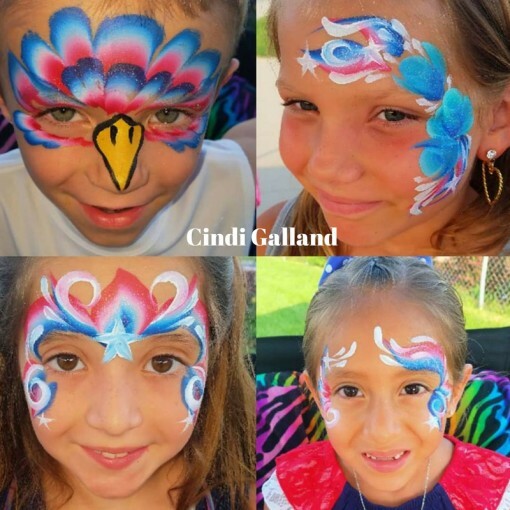 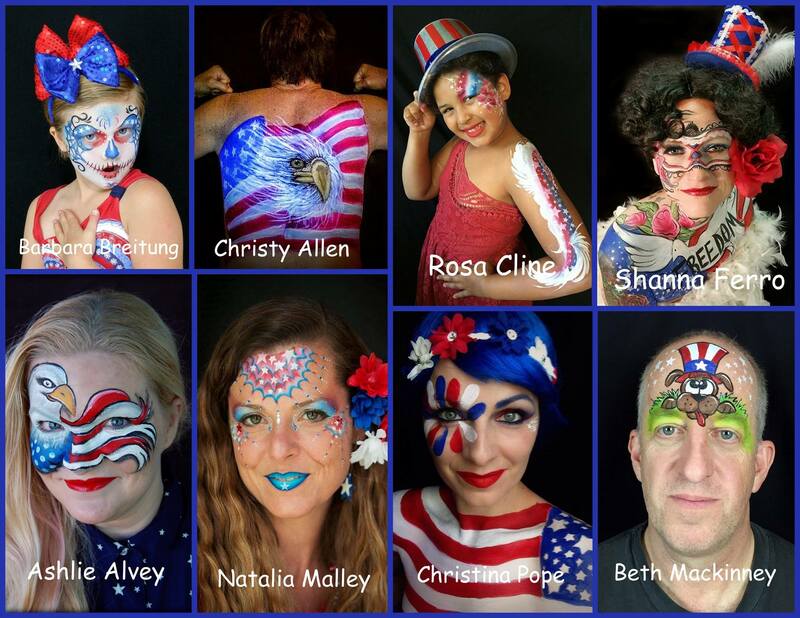 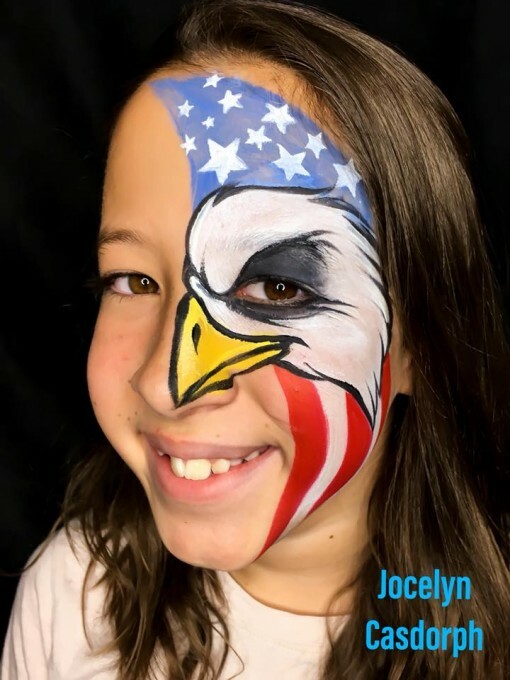 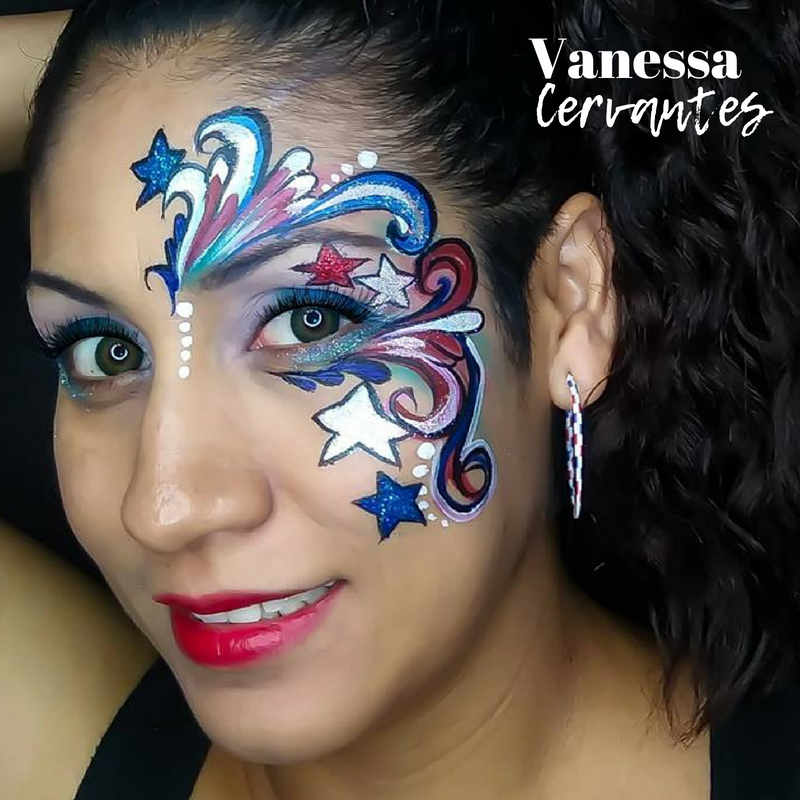 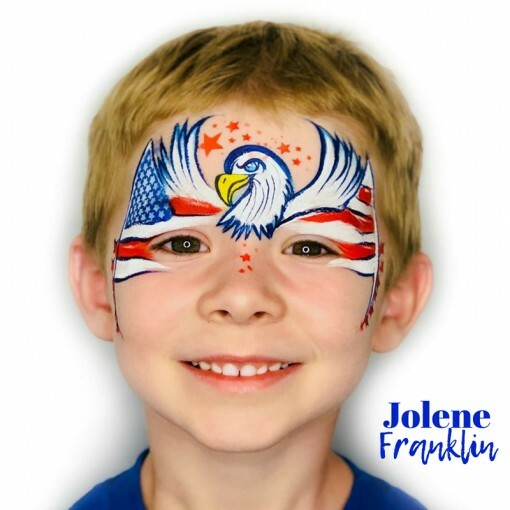 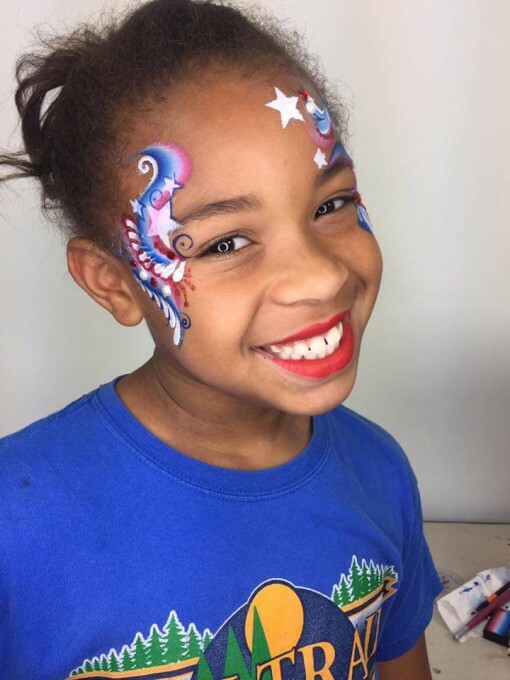 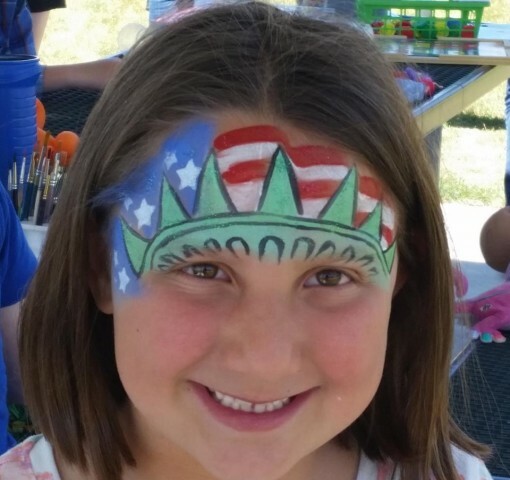 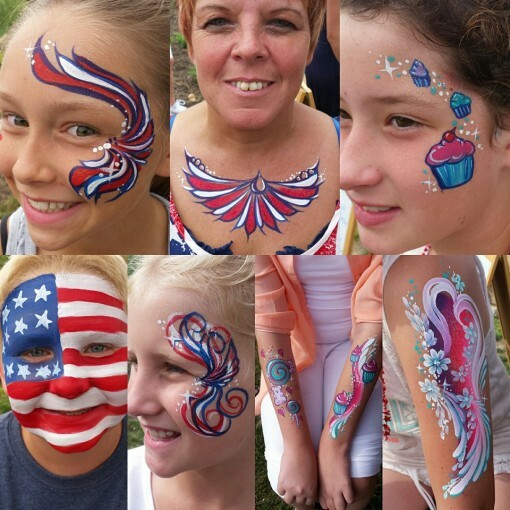 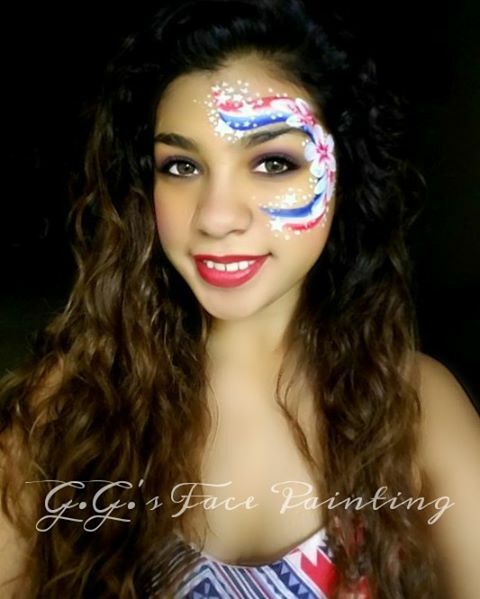 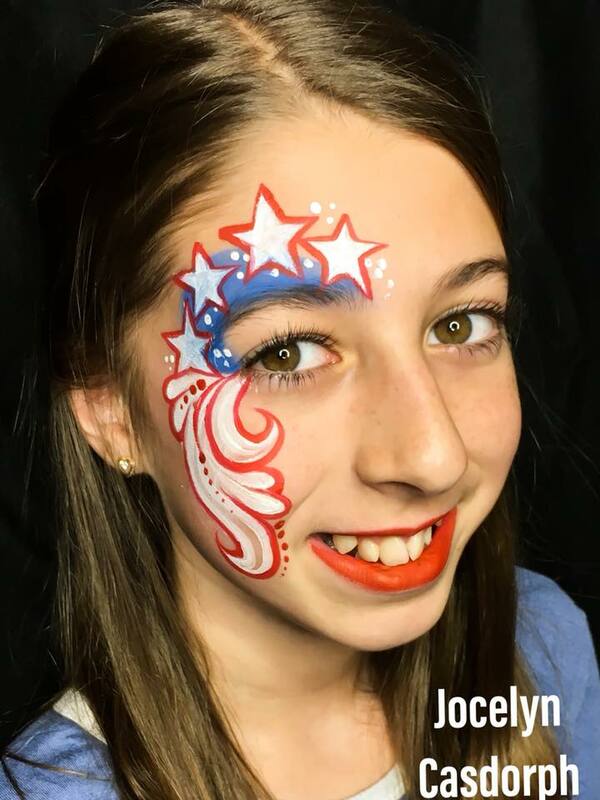 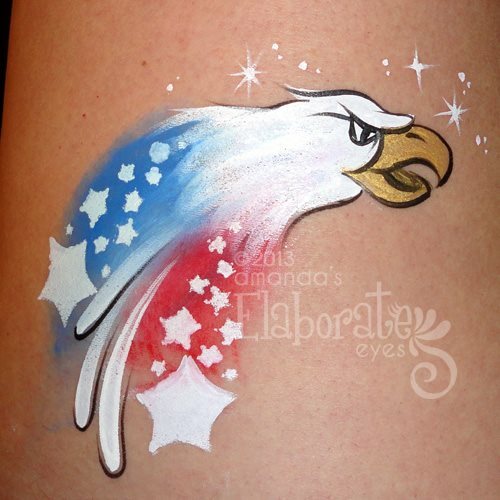 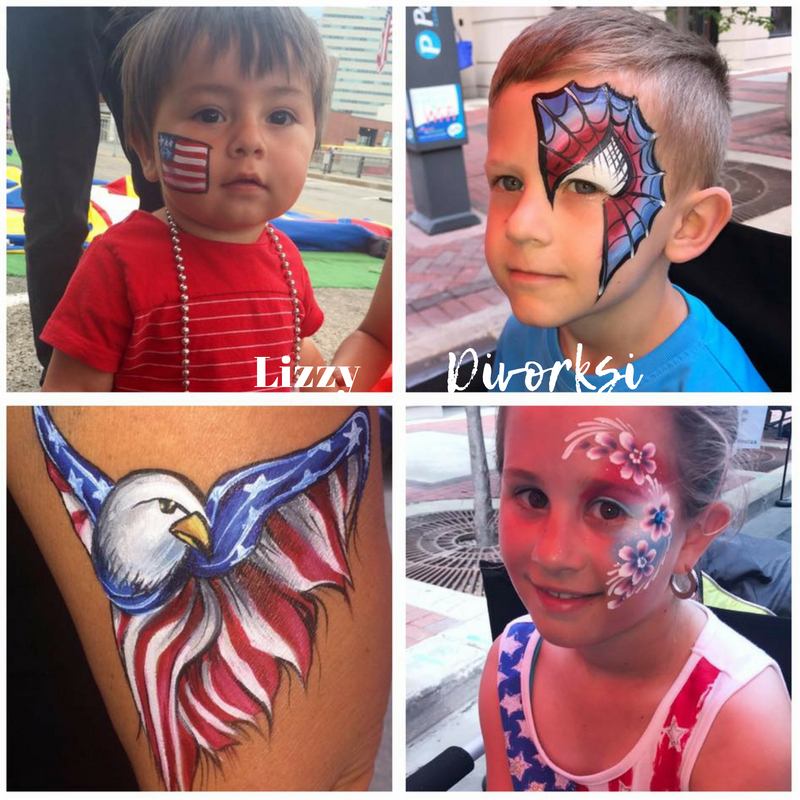 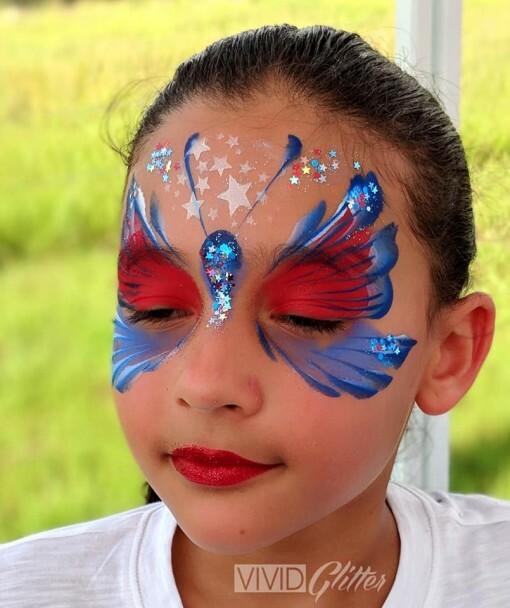 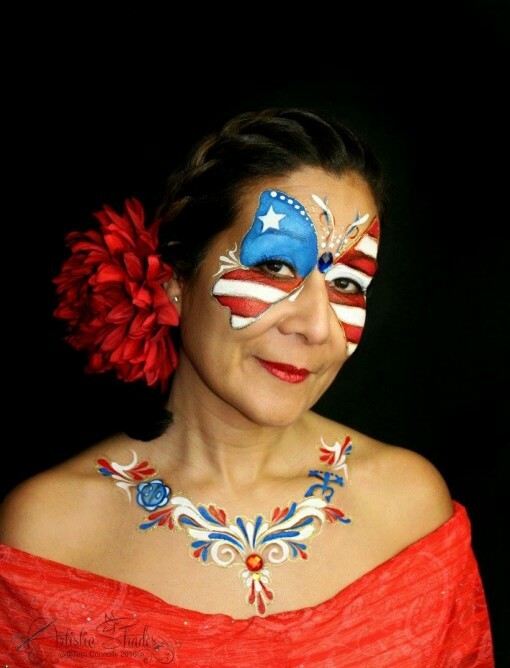 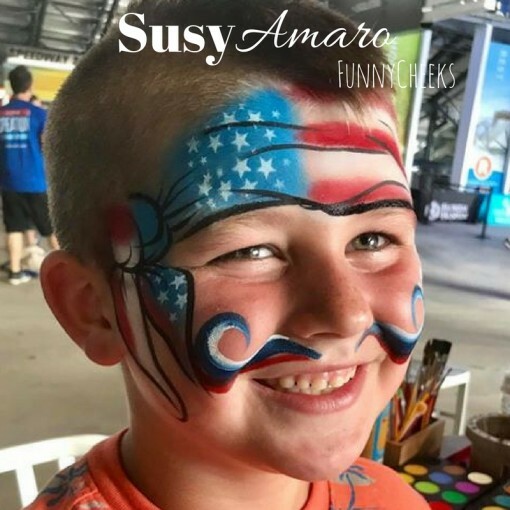 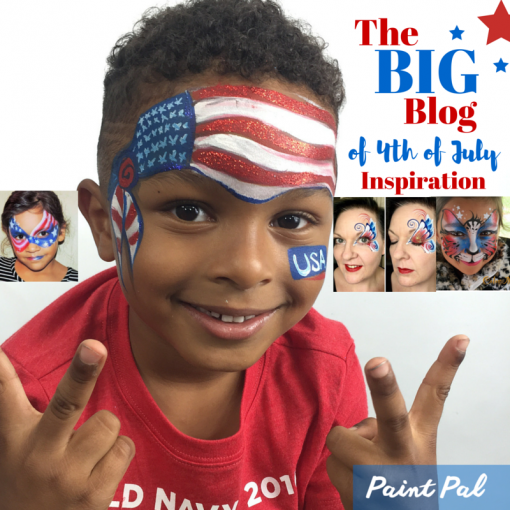 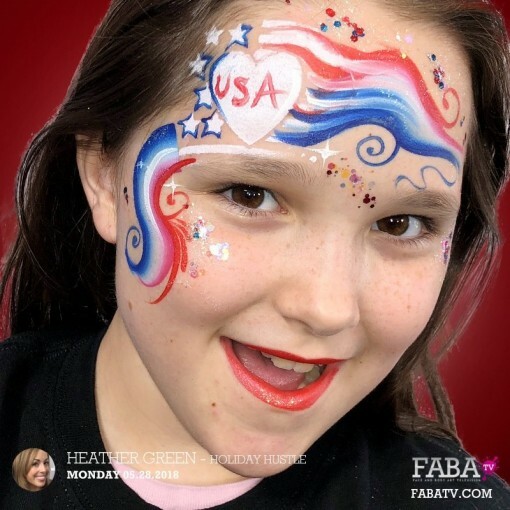 Airbrush tattoos move the line and with Patriotic stencils you can match the theme with ease. 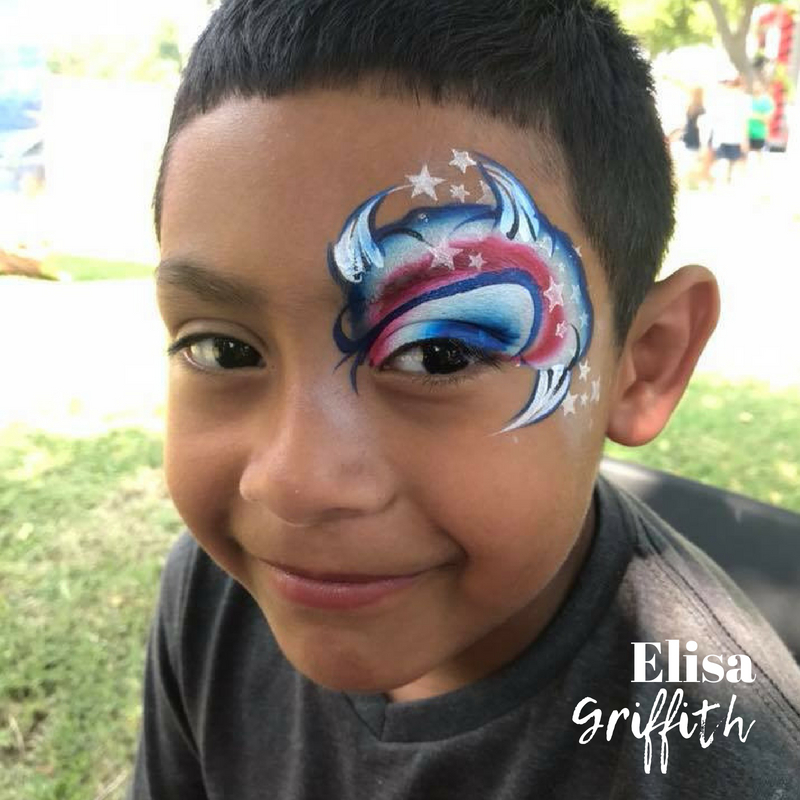 One of my favorite sales quotes by @SalesGravy is You don’t answer a phone that does not ring, if you don’t offer those services you wont sell them. 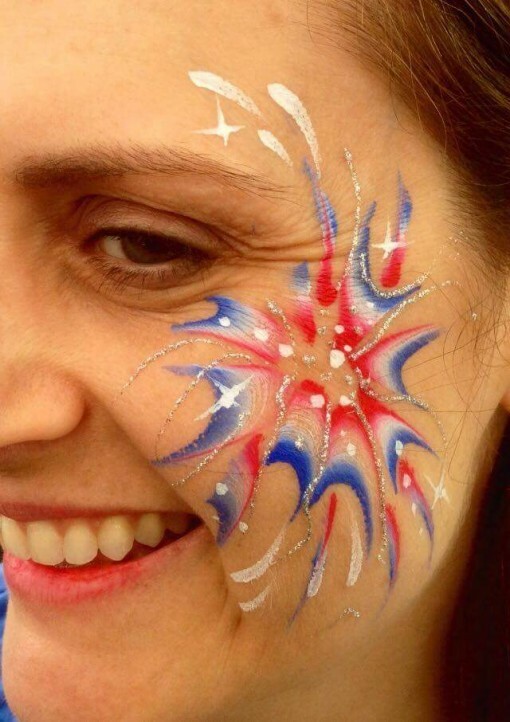 And that could mean the difference between a booked calendar and open days. 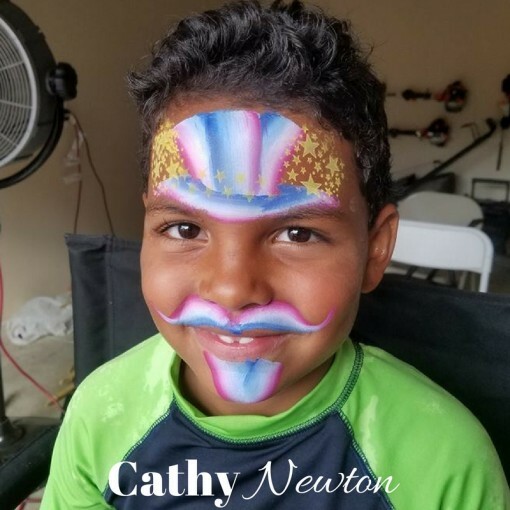 Arty and Rainbow Cake Power! 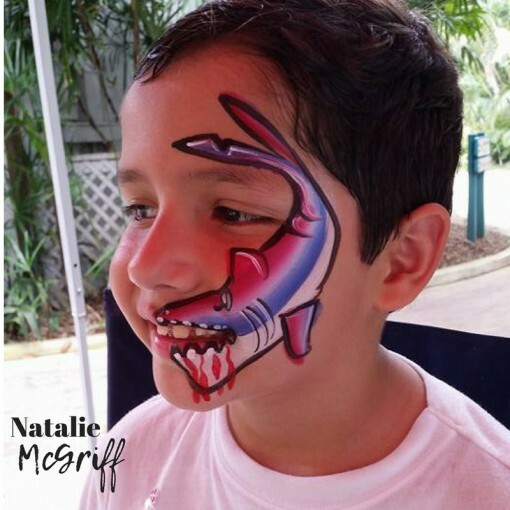 One stroke butterfly using a FunStroke by Cameron Garrett! 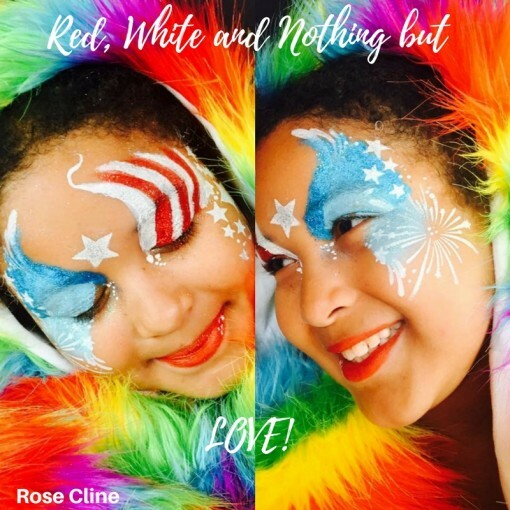 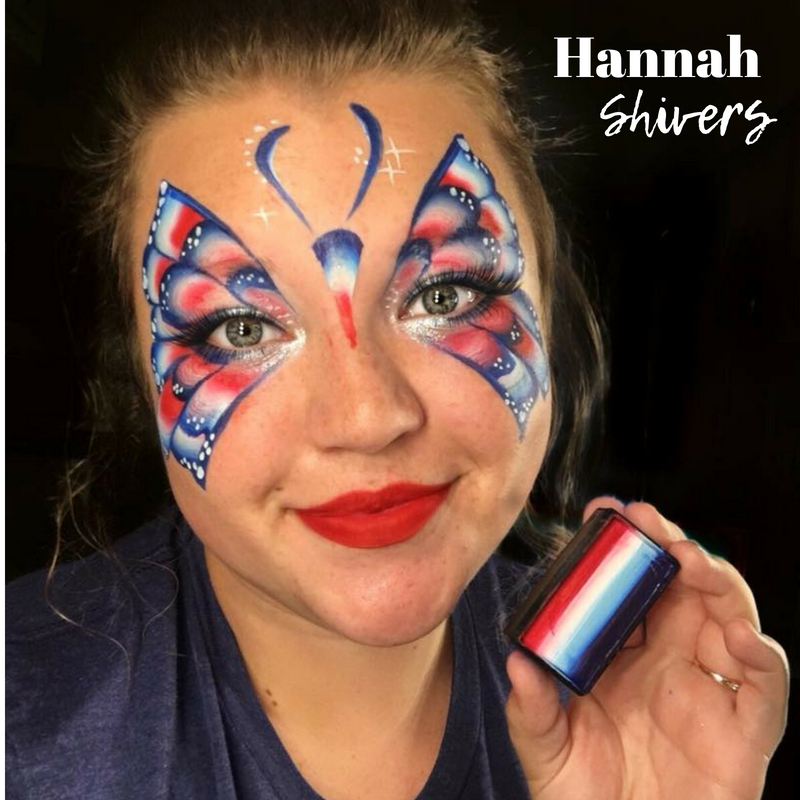 Alisha Ann Johan’s display board is awesome for the red white and blue! 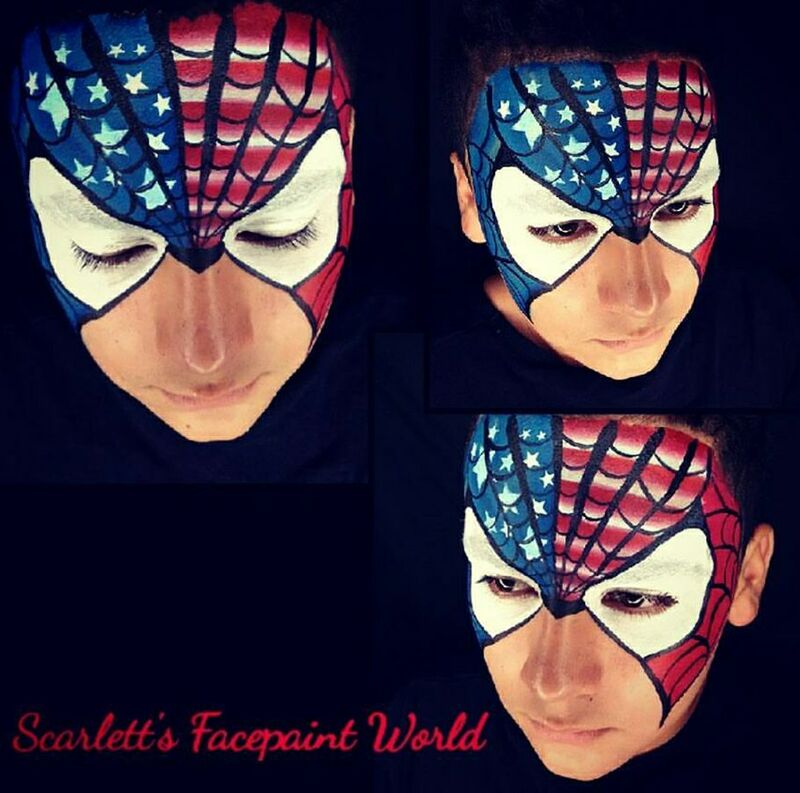 Nancy Peterson had the coolest idea to transform Spidey into a Patriotic hero! 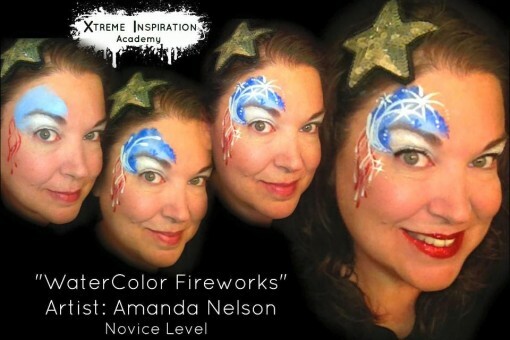 Amanda nelson was featured on the Xtreme Inspiration forum what a HIT! 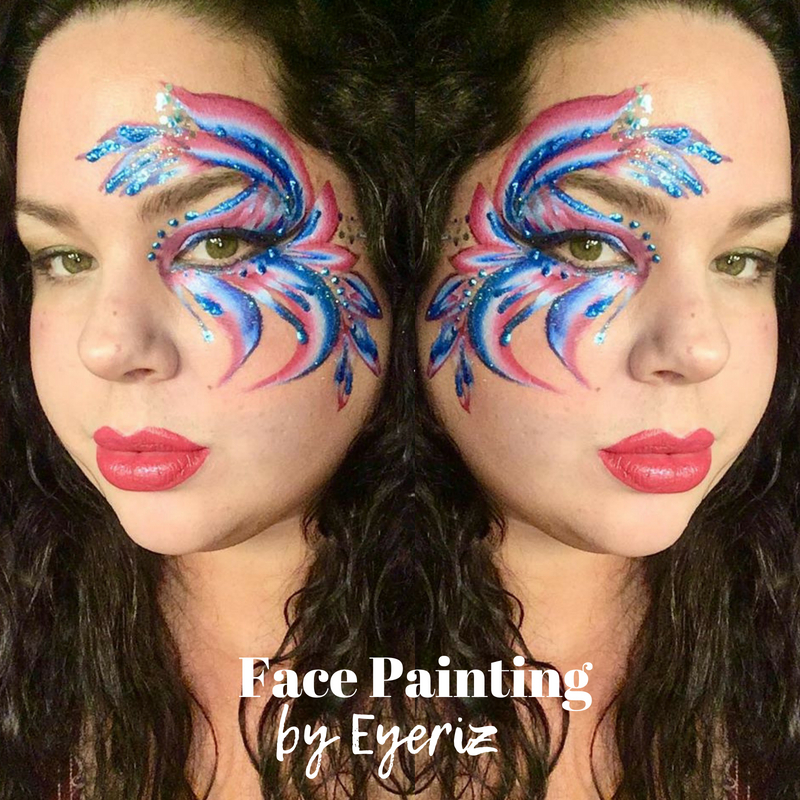 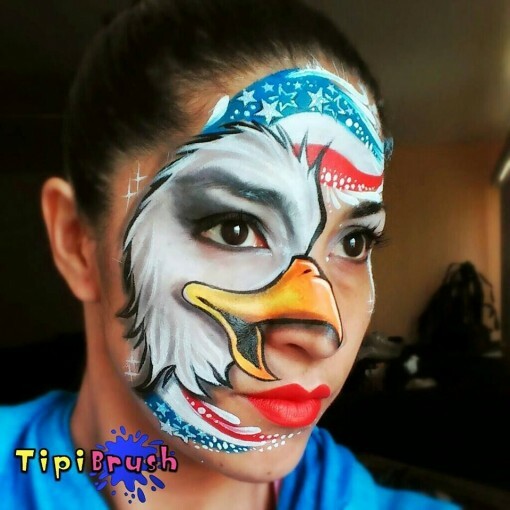 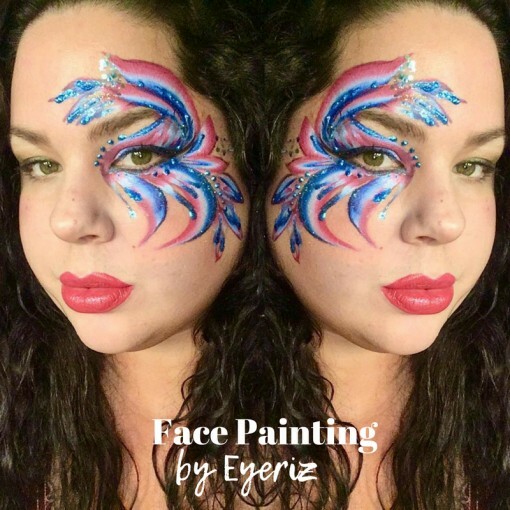 Amanda’s Elaborate Eyes created this awesome eagle mixed design its a total hit! 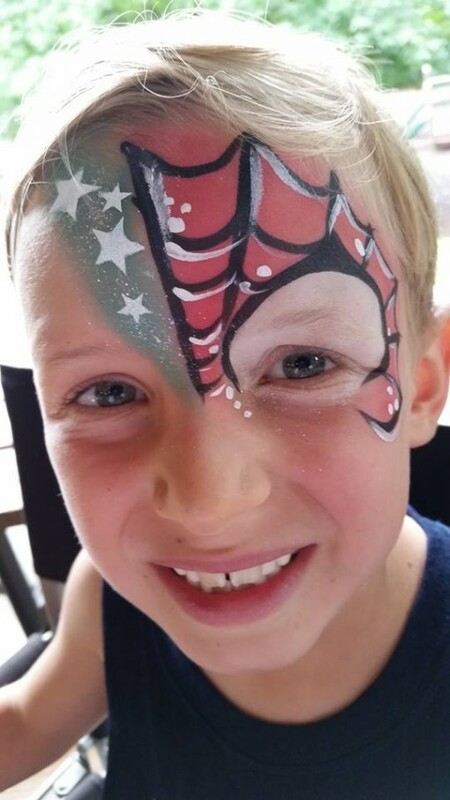 Dess Legend helped out left hand people by giving us different designs on both sides to avoid symmetry thank you! 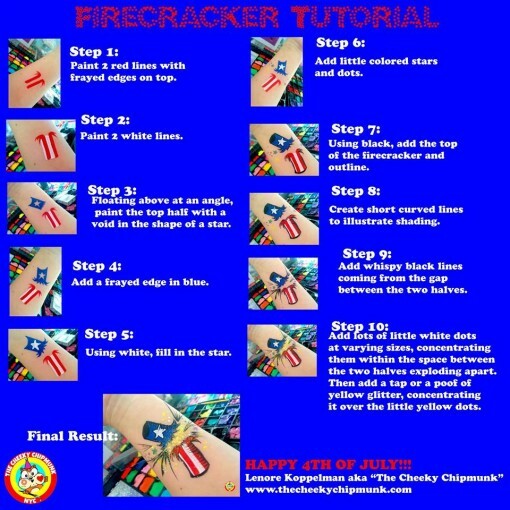 Laura Oliver shared this awesome quickie perfect for the fireworks effect! 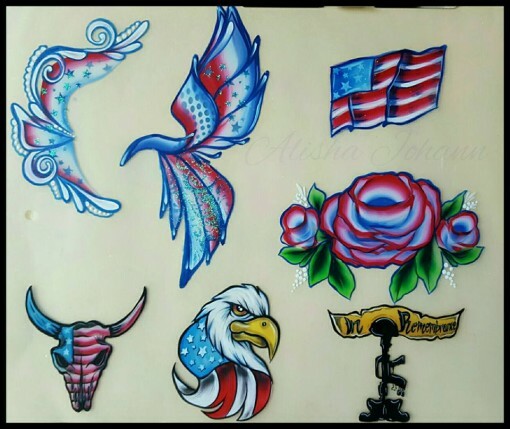 If you are feeling fancy here’s some BUMPED up designs that will rock your menu board! 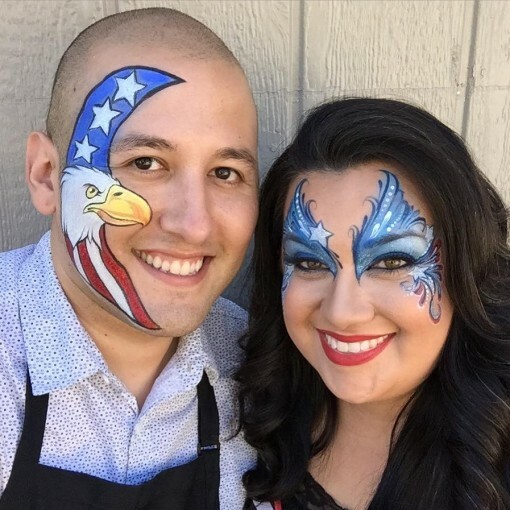 Ronnie Mena and Shawna De Real Need I say more! 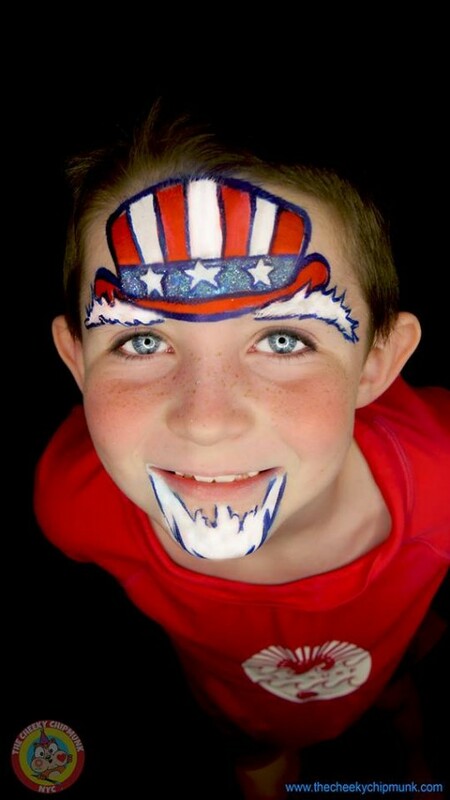 The cutest Uncle Sam ever! 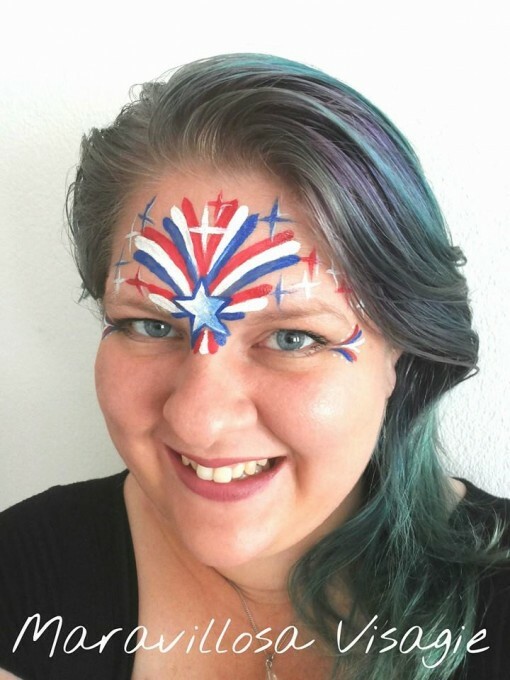 The Cheek Chipmunk does it again! 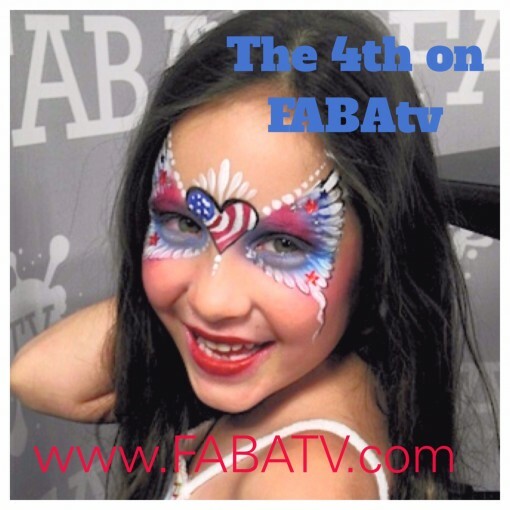 Check her out teaching on FABAtv! 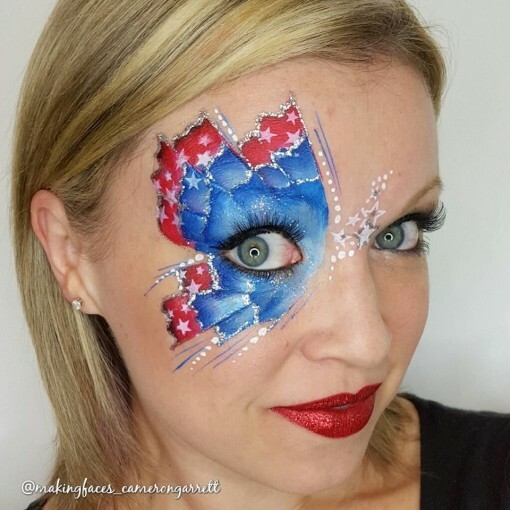 Jennifer Drinkwater said why stop at just the face lets show our spirit! 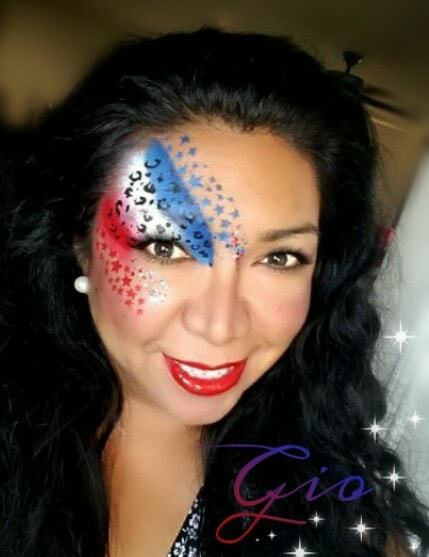 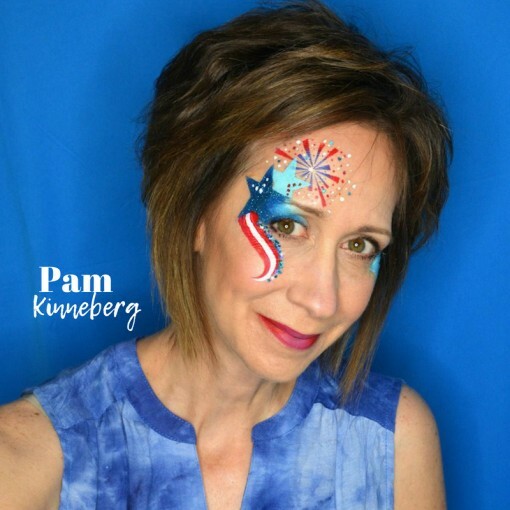 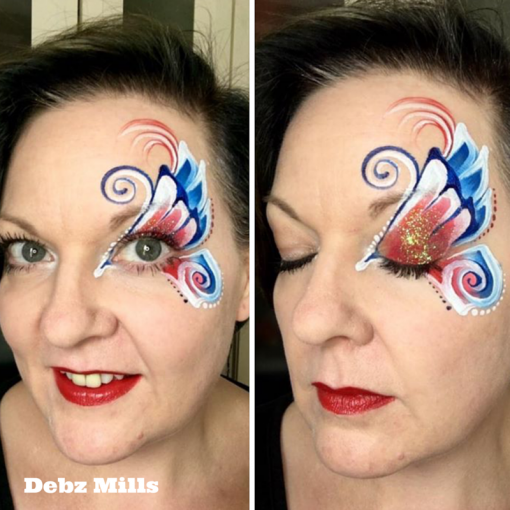 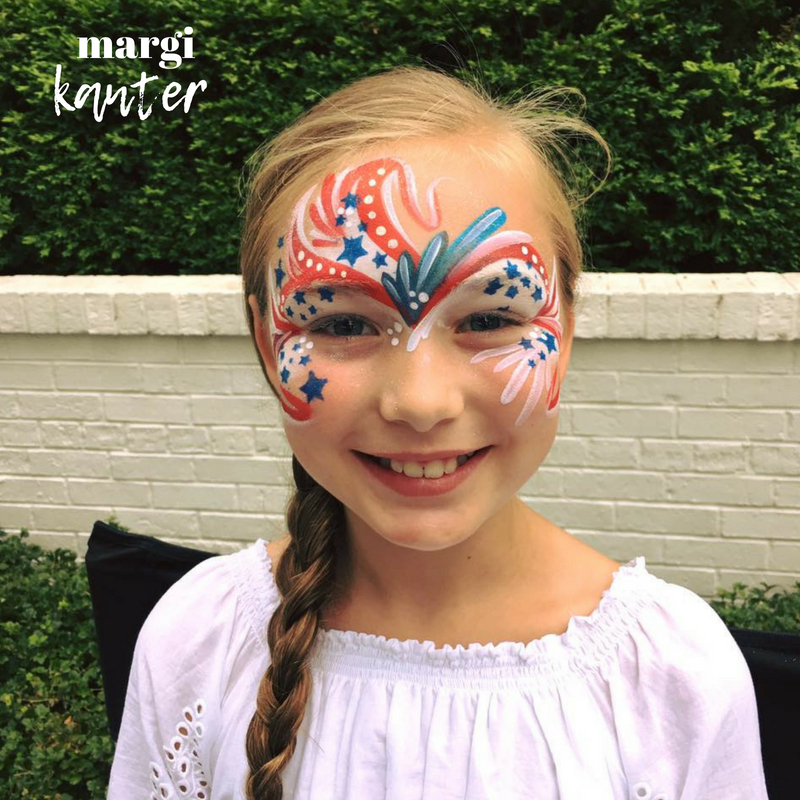 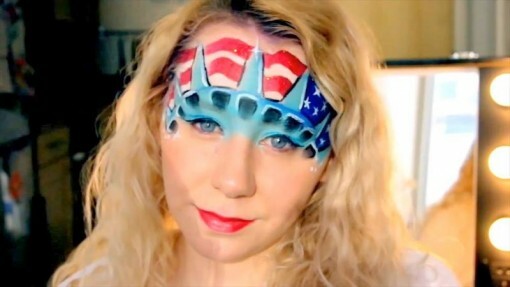 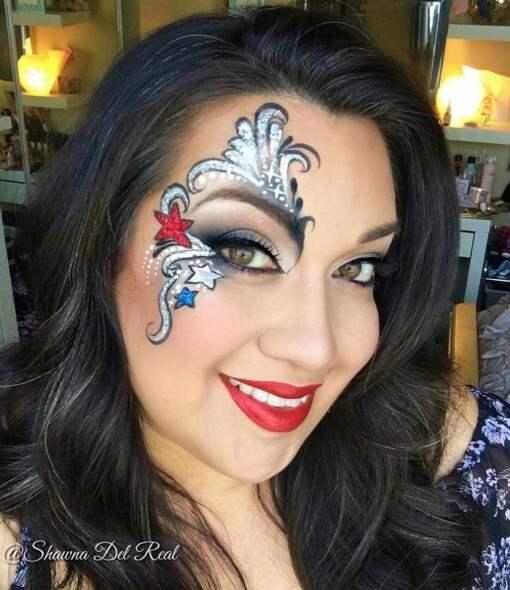 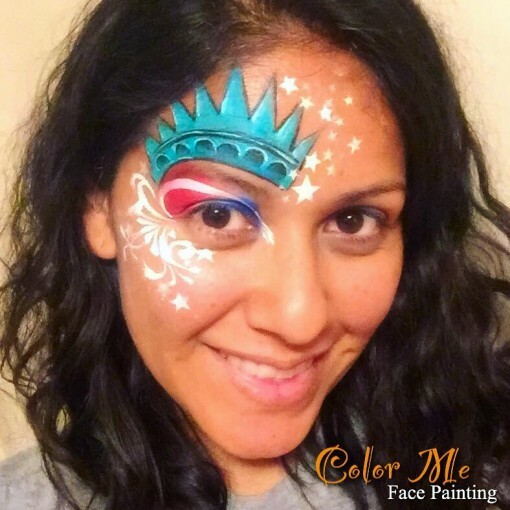 Debz created this design for Queens day but it works awesome for 4th of July too! 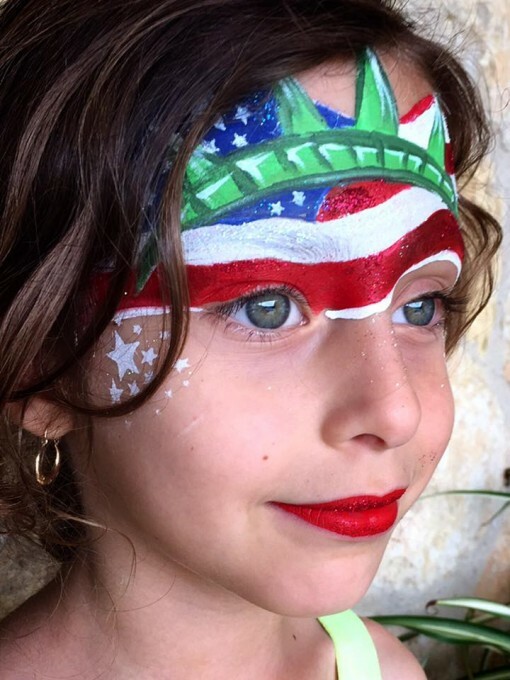 Our Lady Liberty by “Georgia Paris” awesome! 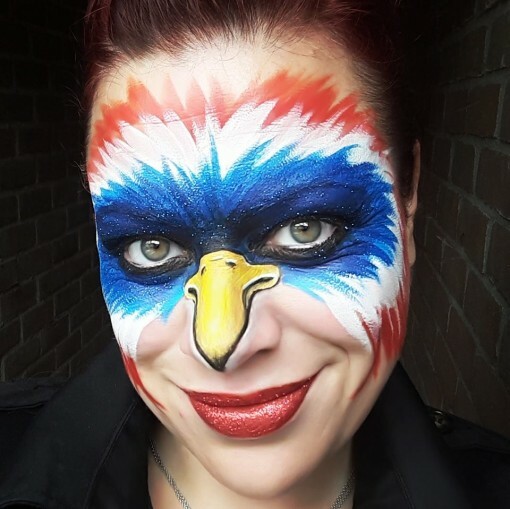 Mary Gryphons version rocks too! 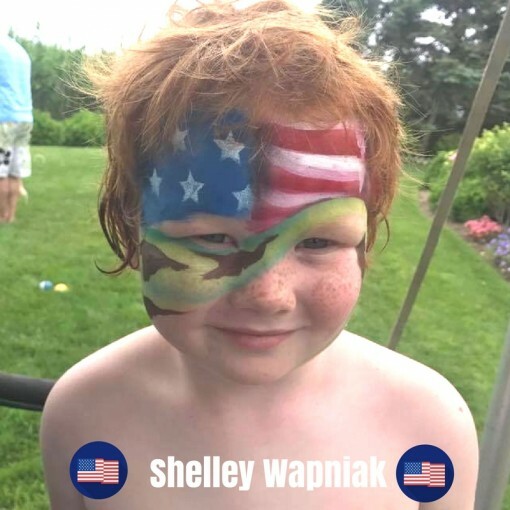 USA Pirate add a patch and you are good to go. 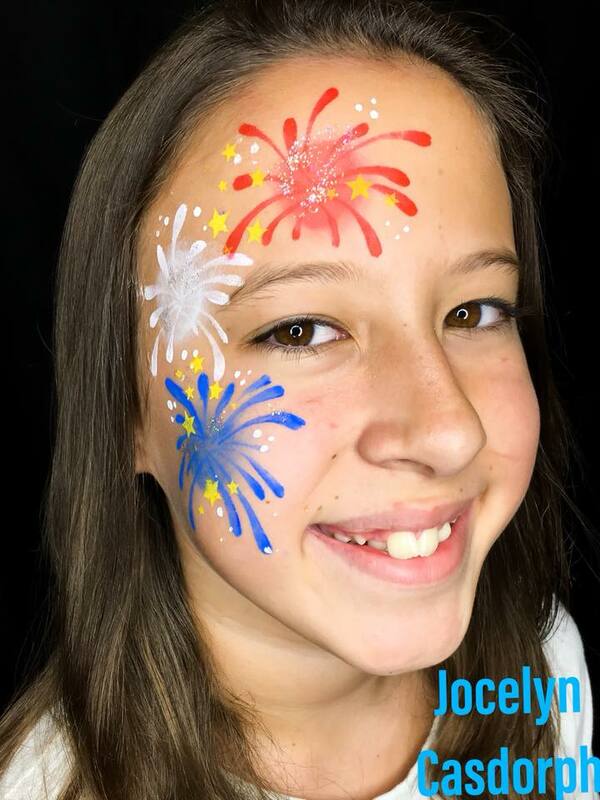 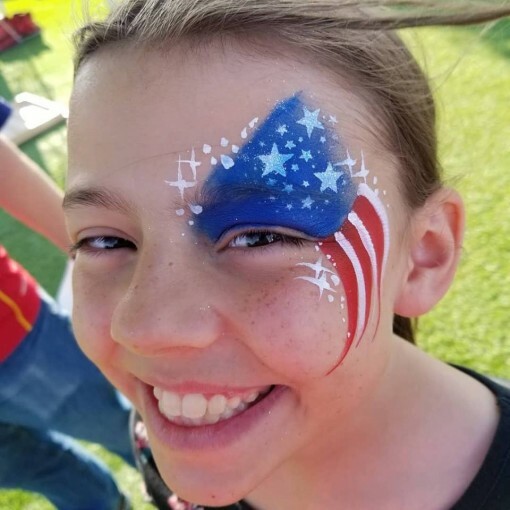 Abby Solideo knows that the more glitter you add the bigger the smile! 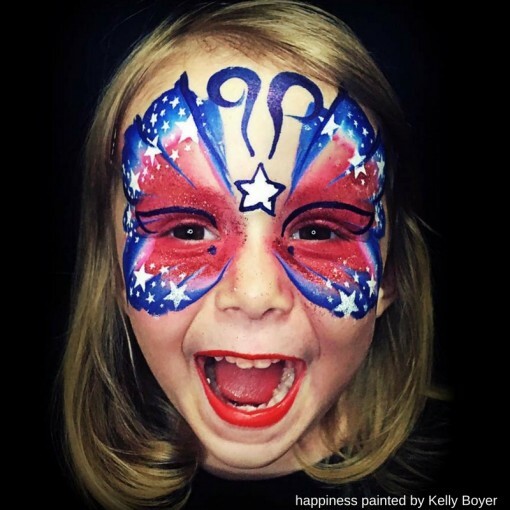 How happy is this 4th of July cutie! 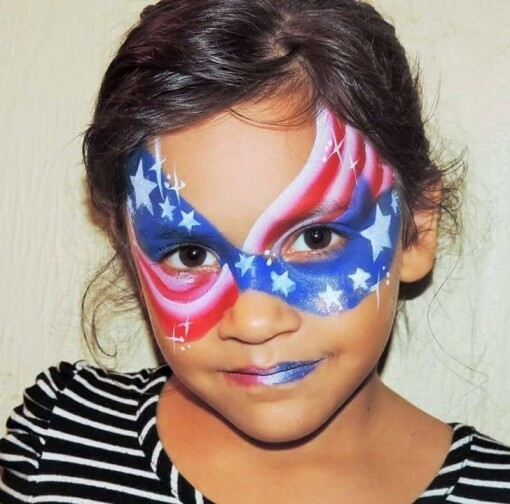 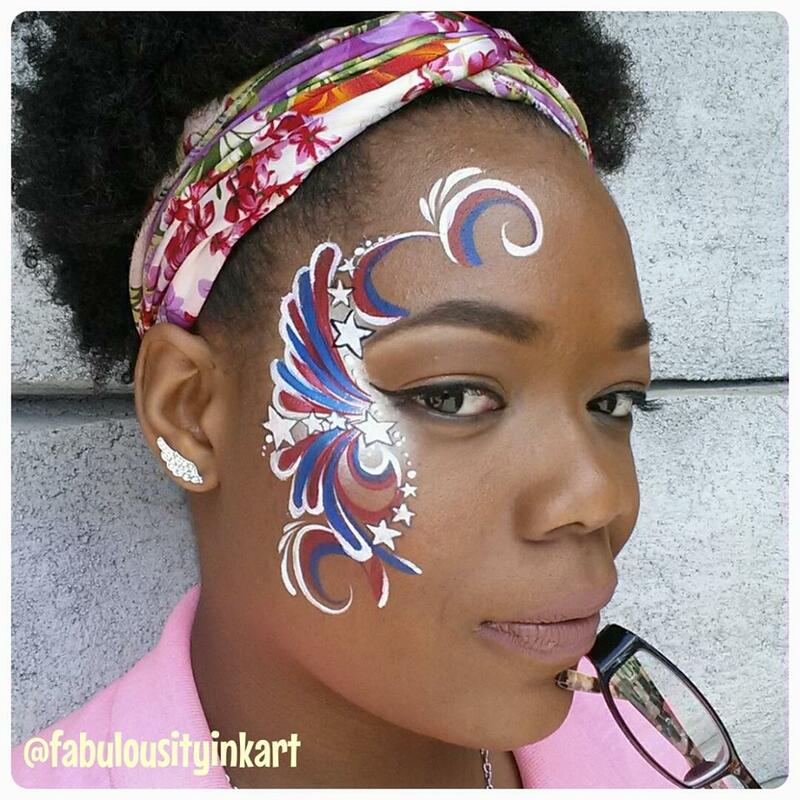 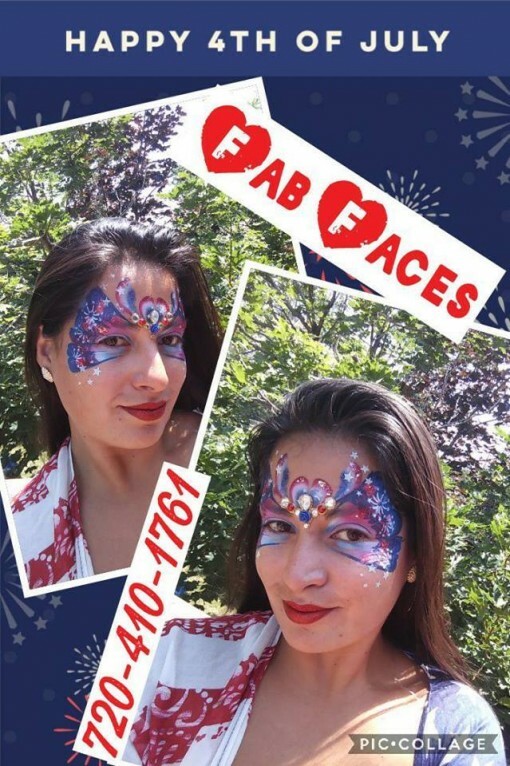 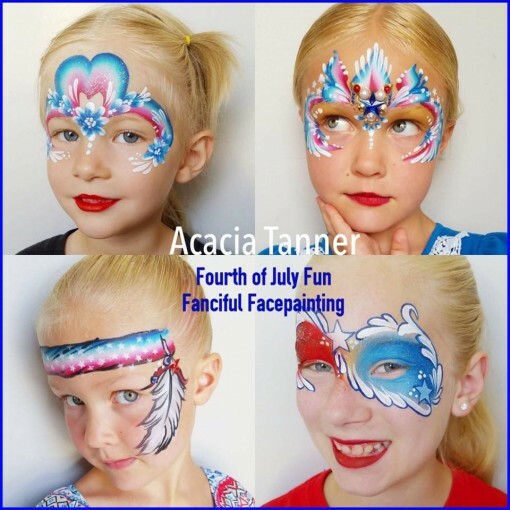 Lamar Garcia of FAB Faces adds some bling and fireworks and voila its a hit! Flowers and 4th of July YASSS! Jolene Franklin rocked some inspiration from Heather’s Holiday Hustle Class on FABAtv and its a hit! 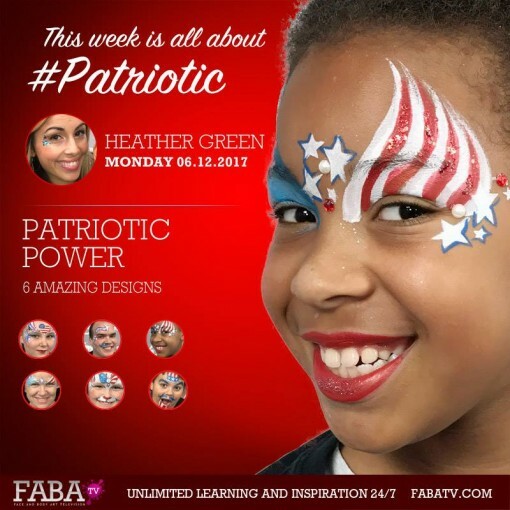 Have you checked out this awesome class on fabatv? 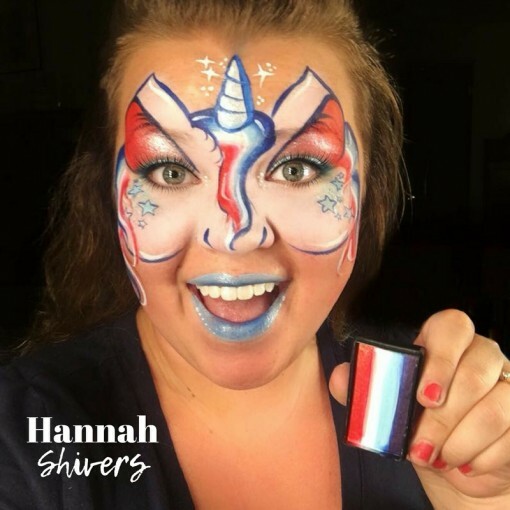 Hannah Shivers! 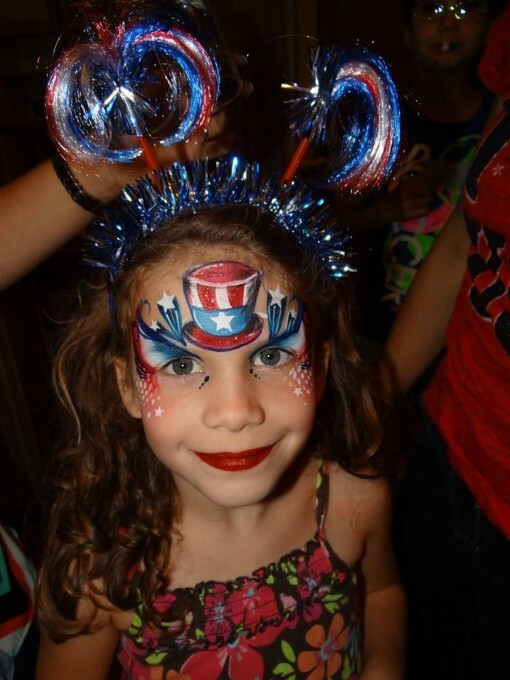 She rocked her 4th of July cake! 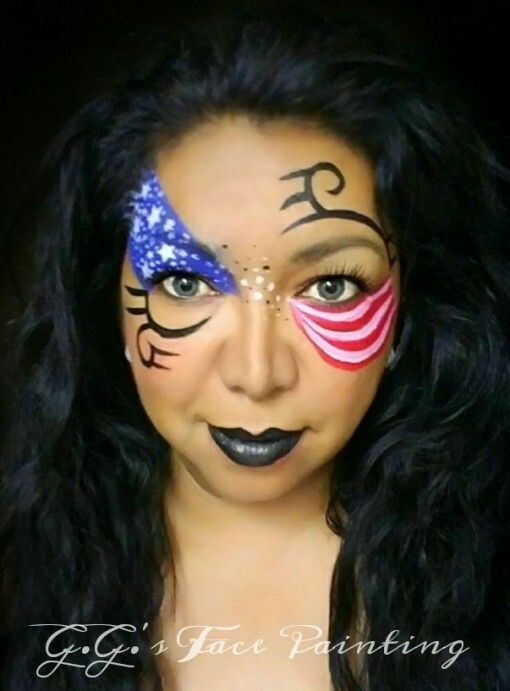 When I studied finance and worked in a corporate office I invested in business attire, business casual and lots of pantyhose. The same rules should apply if you are a face painter or entertainer. 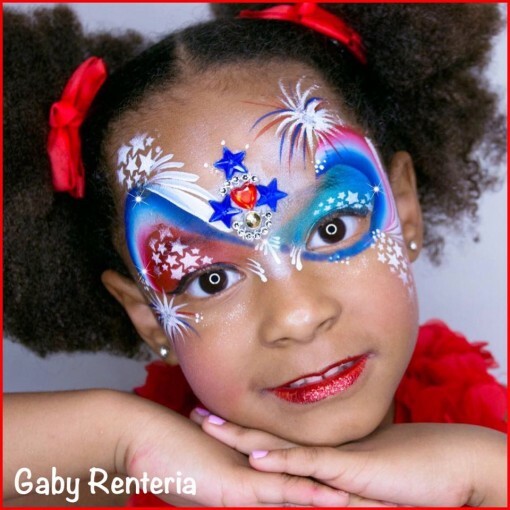 Invest in a set up and wardrobe to meet your busy times of the year, Halloween, 4th of July, Christmas and celebrations. 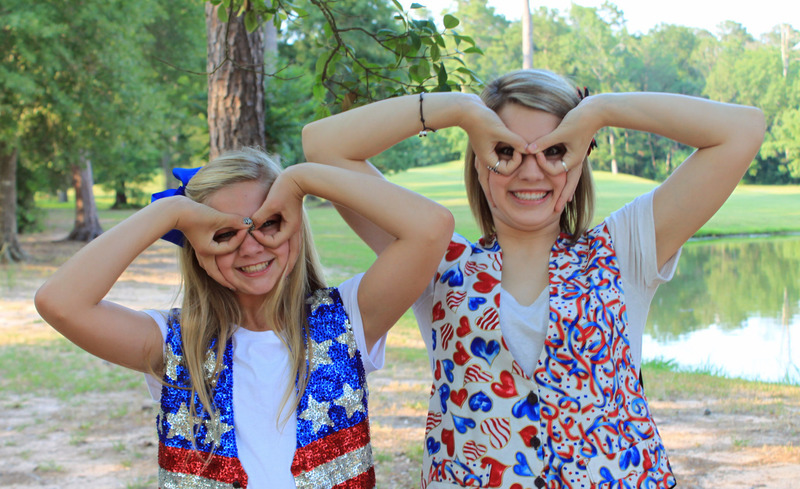 I love my Glitter Aprons, Berets, and when its not deathly hot I love my sequin vests. 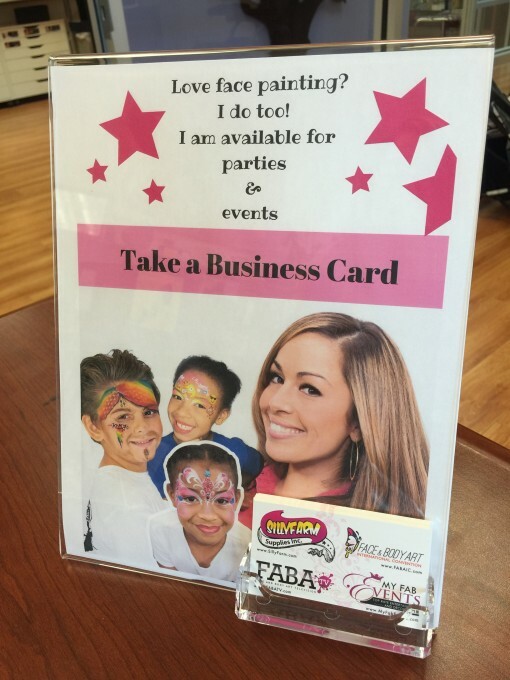 Clients LOVE when you enhance their event and a good looking outfit will do that for you. 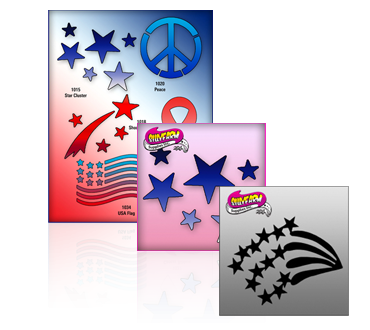 Plant Seeds to have your calendar in full bloom! 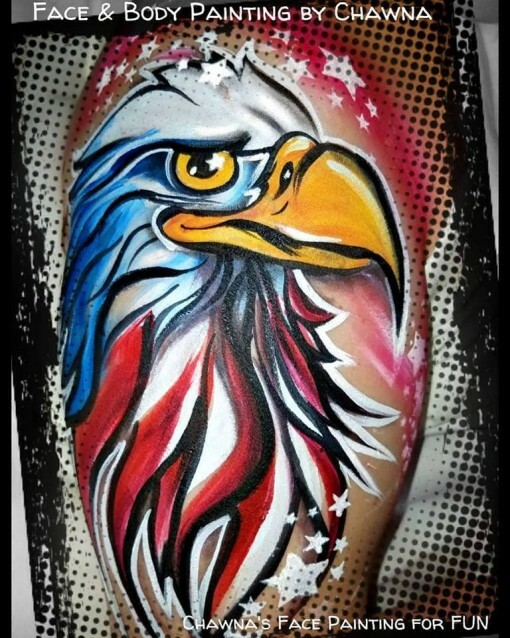 and it couldn’t be more true. Its not enough to do the least and expect the most. 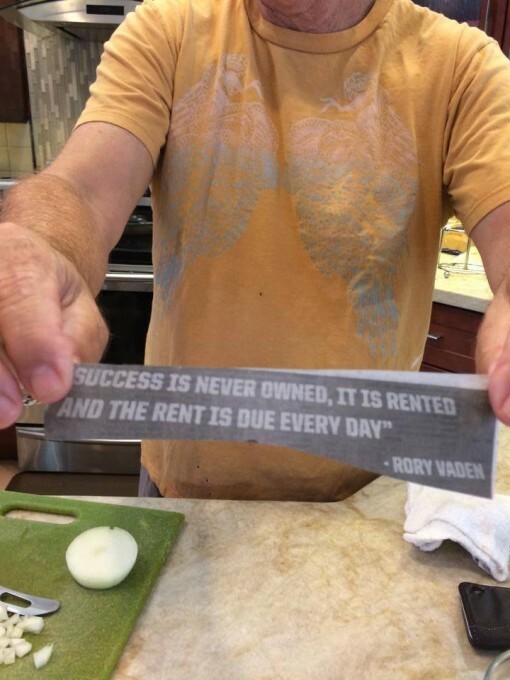 If you want to see great results you have to put in great work. 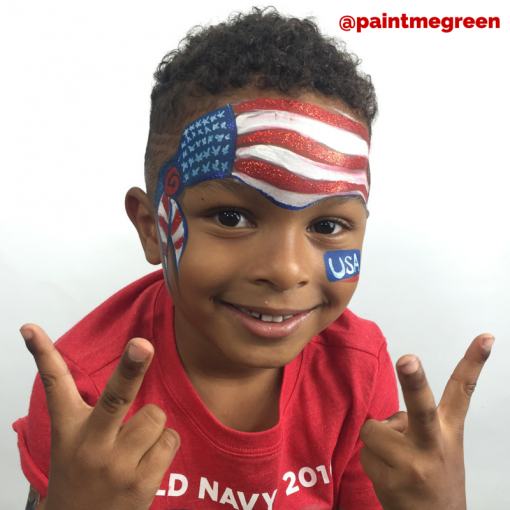 Great work means more than just being a great painter. 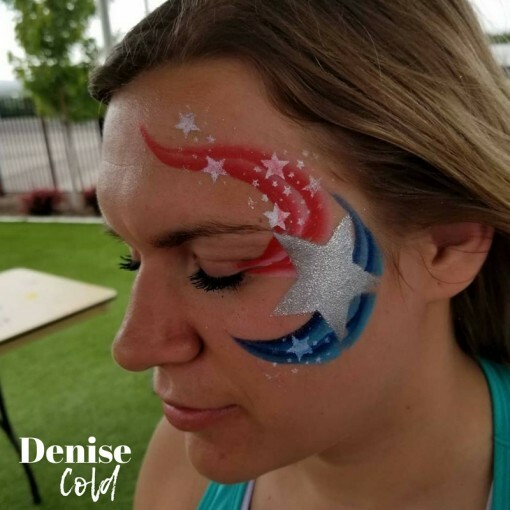 When someone hired you they want to feel like they got their monies worth with a little extra effort you can exceed their expectations and create ways to fill your calendar for the 2nd half of the year!